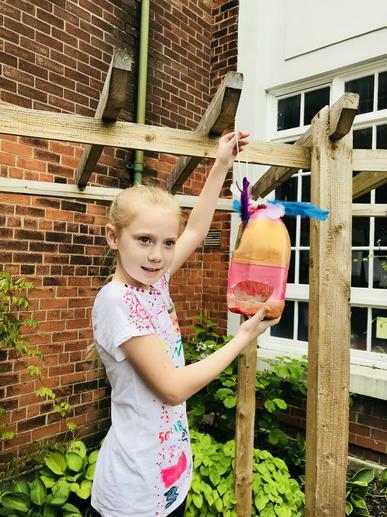 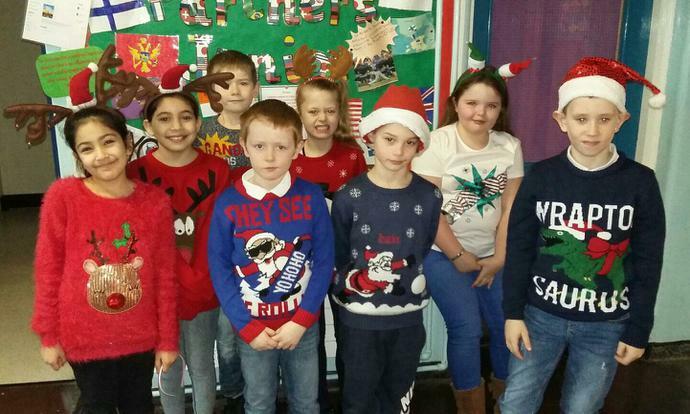 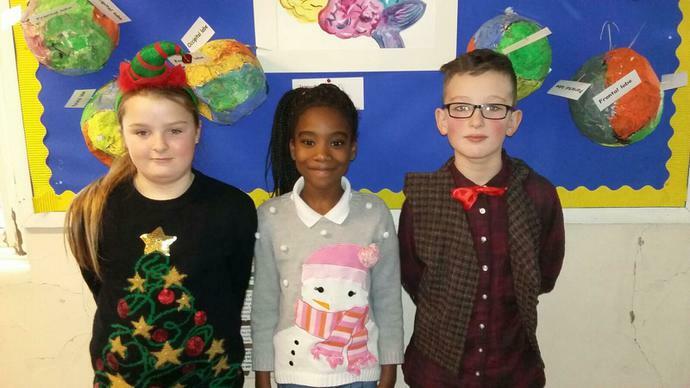 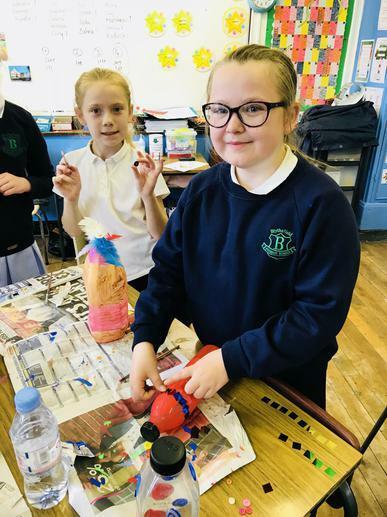 Primary 4 and 5 showcasing their creativity through their excellent handmade bird feeders. 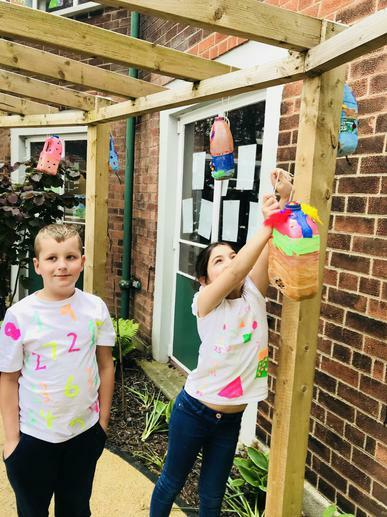 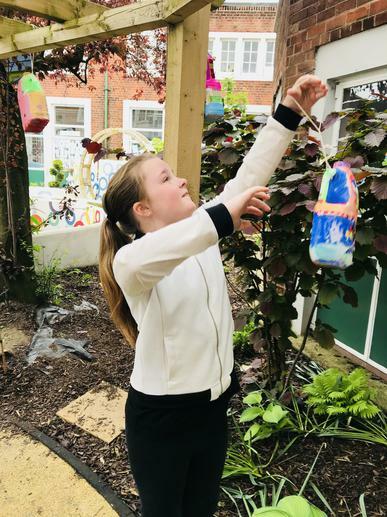 These are now displayed in our school garden and I’m sure the birds will love them. 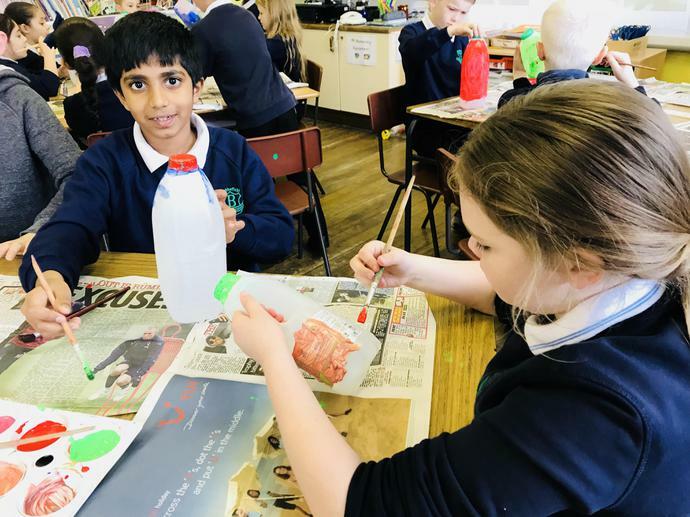 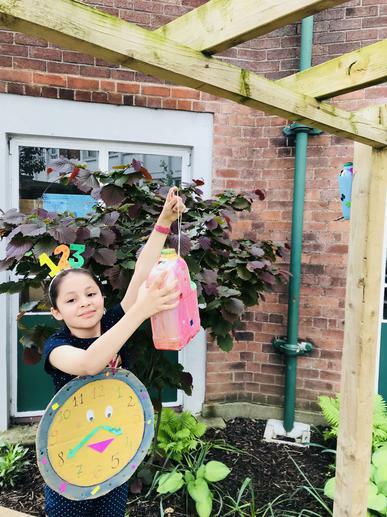 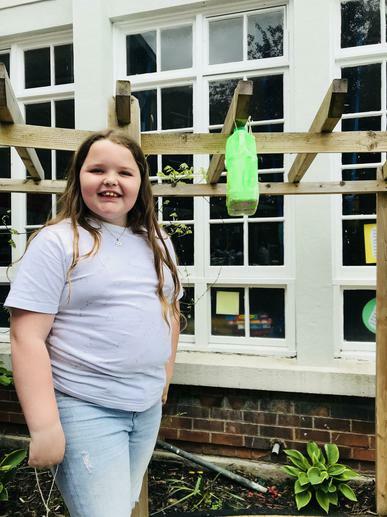 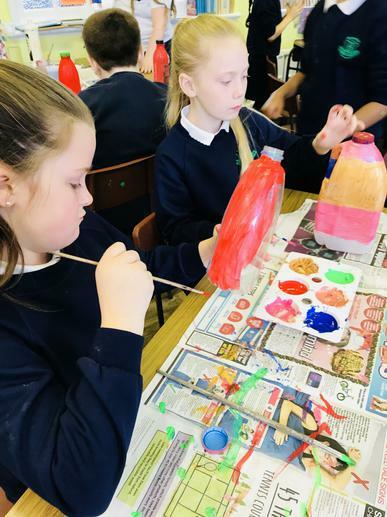 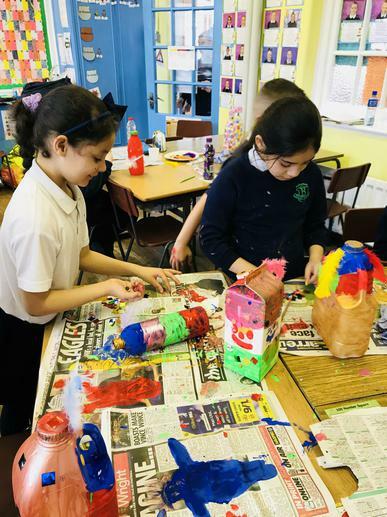 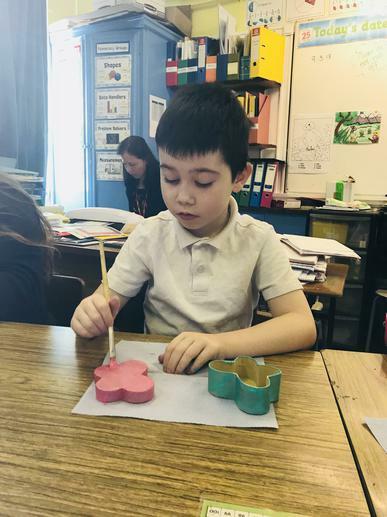 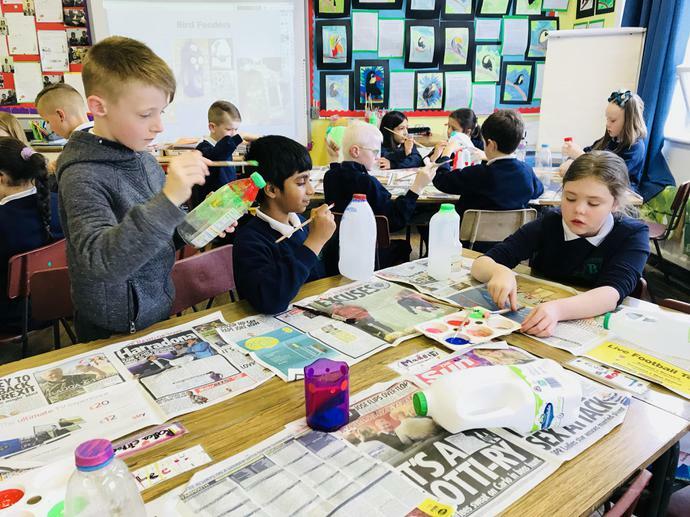 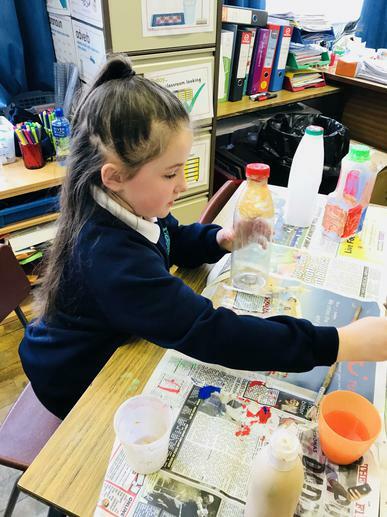 P4 and P5 have started to create and decorate their bird feeders. 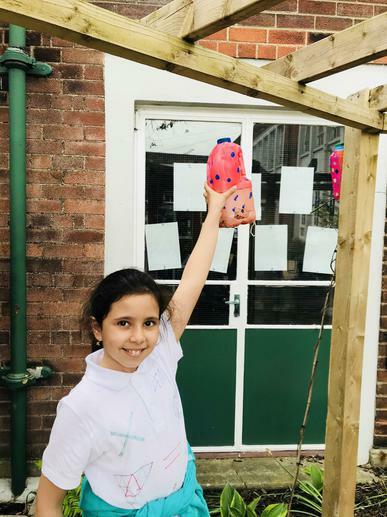 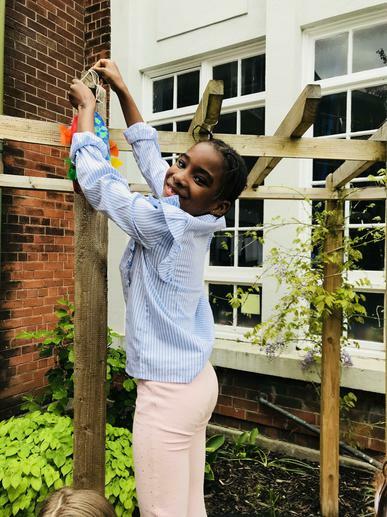 We look forward to hanging these in our school garden. 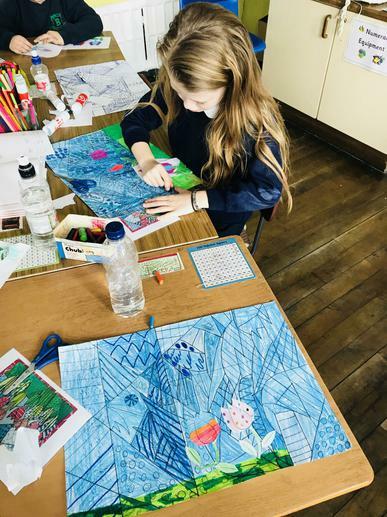 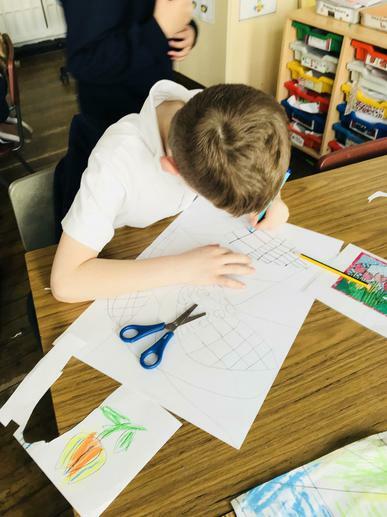 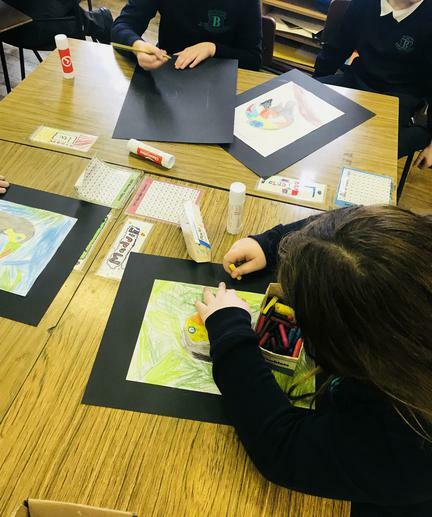 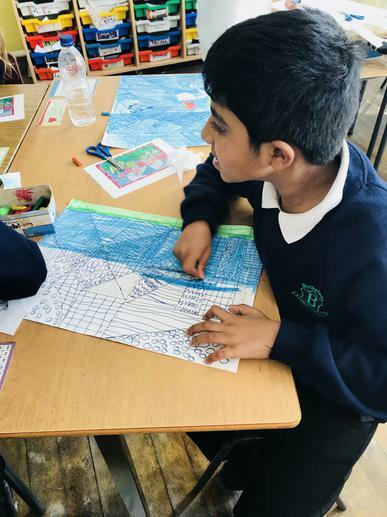 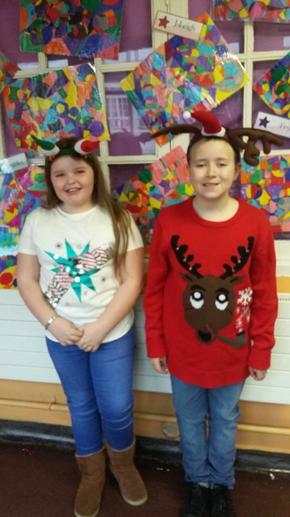 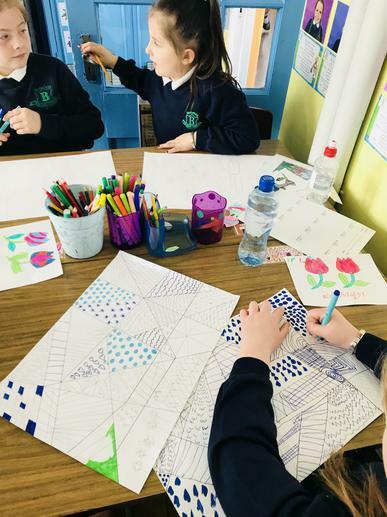 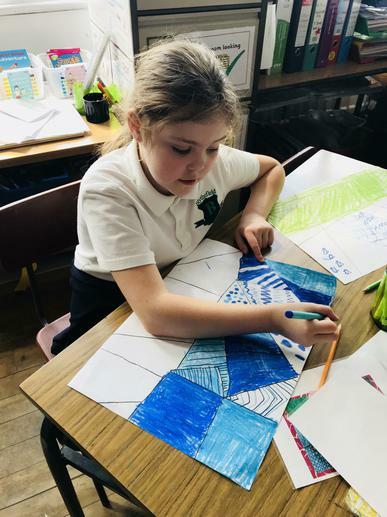 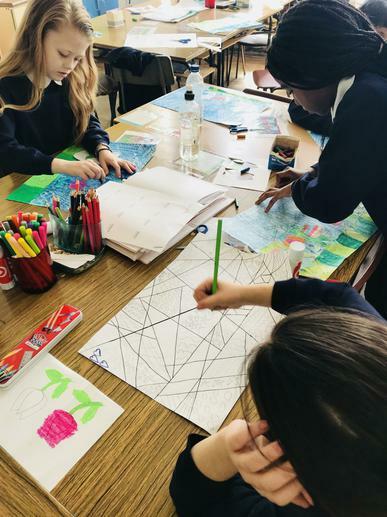 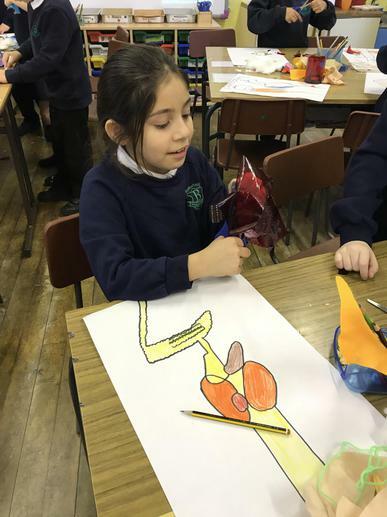 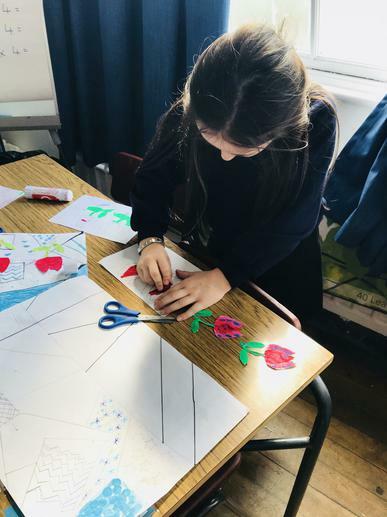 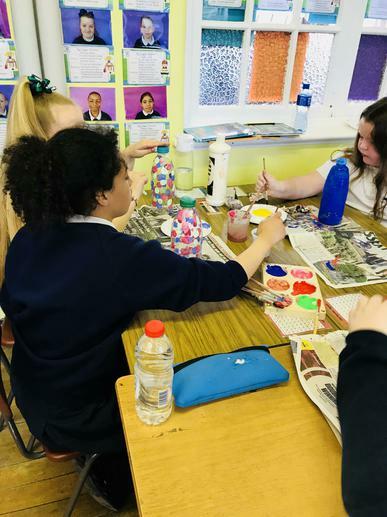 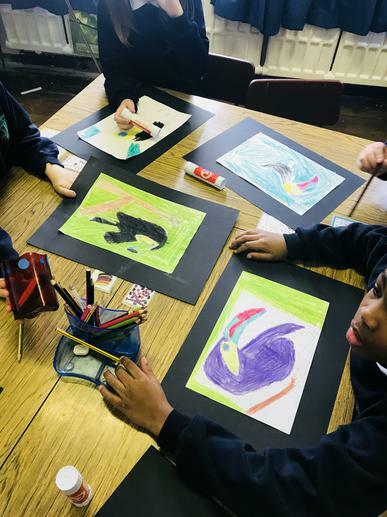 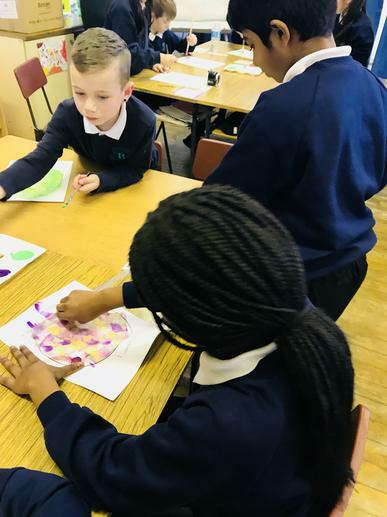 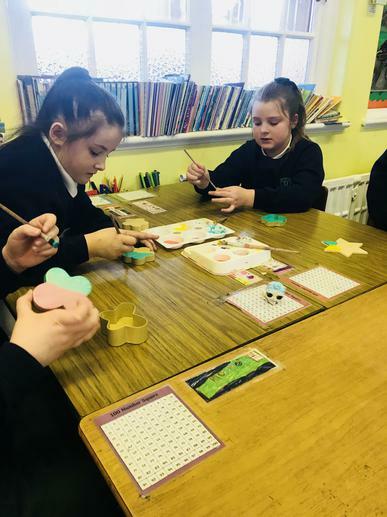 P4 and P5 have been learning all about Romero Britto and have been focusing on pop art and cubism. 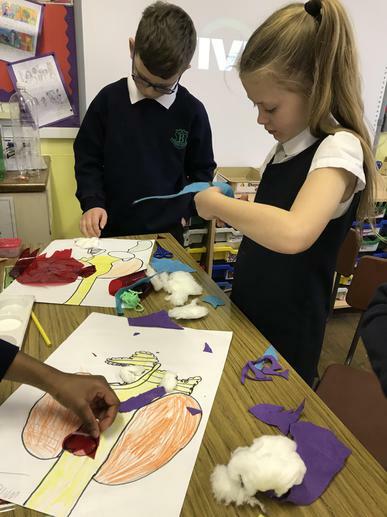 They went on to create their own tulip paintings in this style. 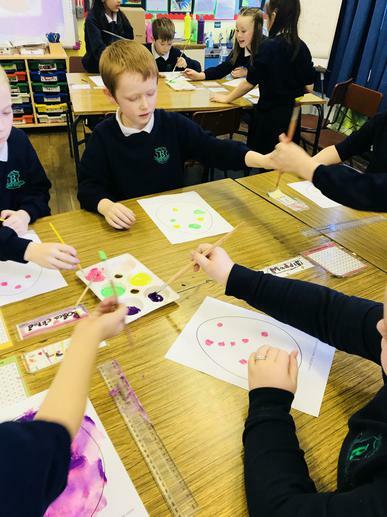 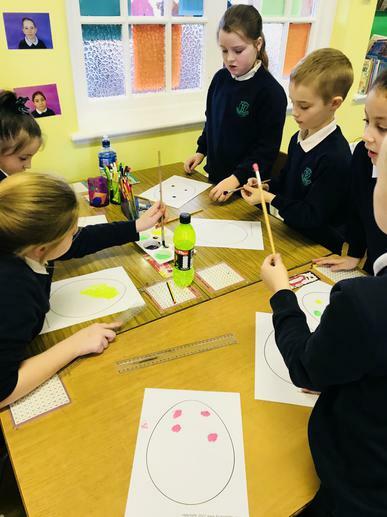 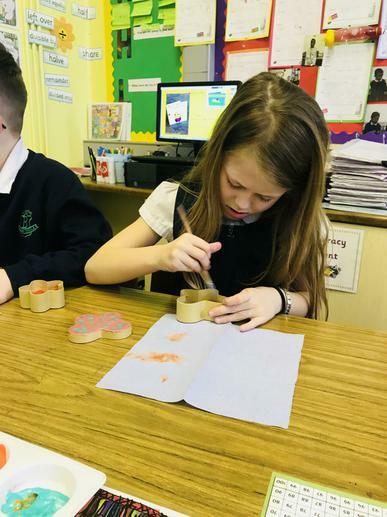 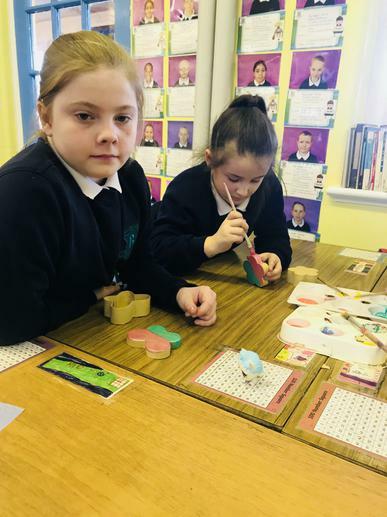 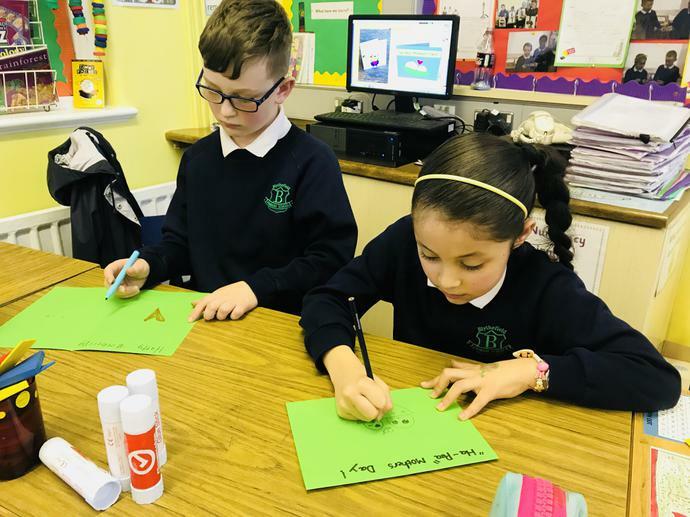 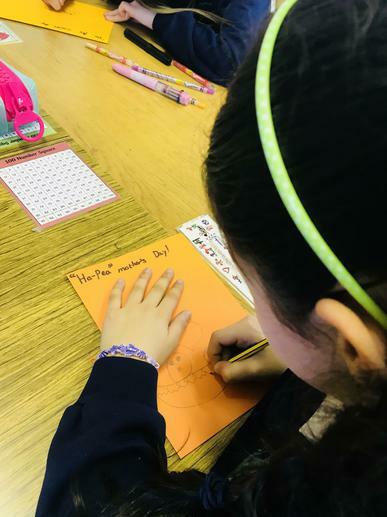 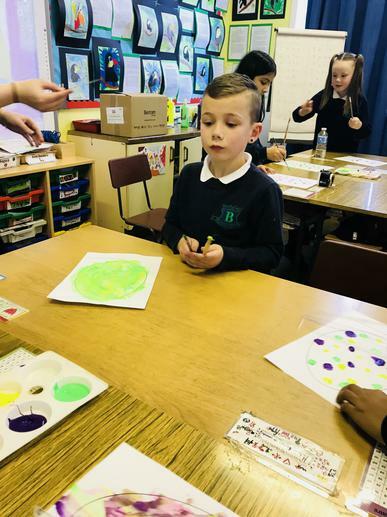 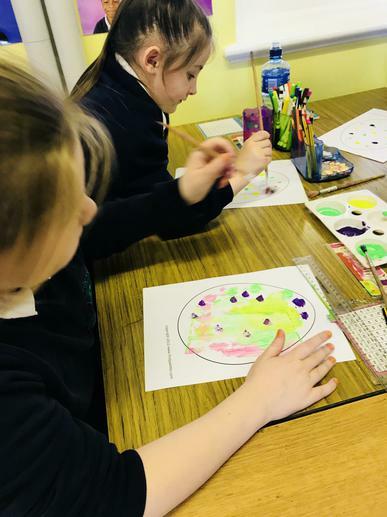 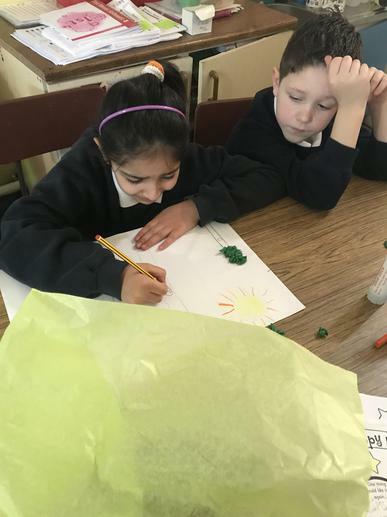 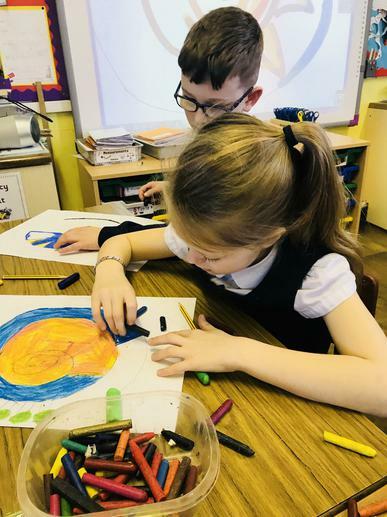 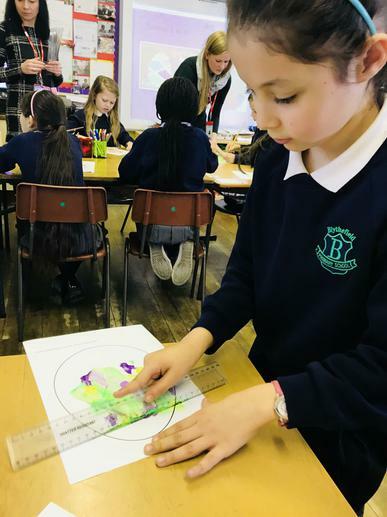 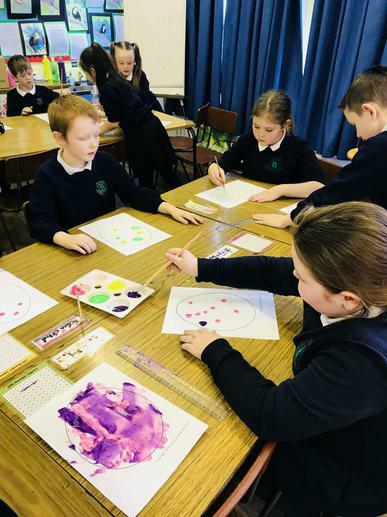 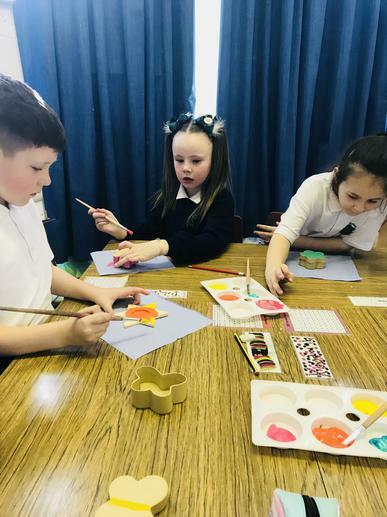 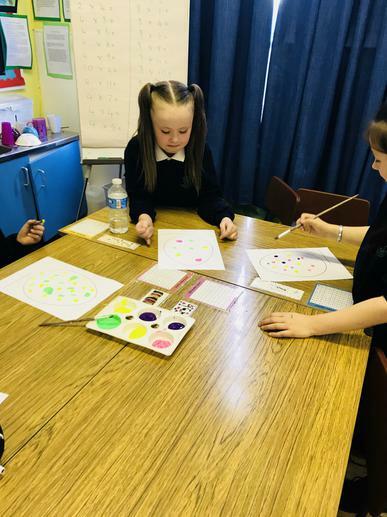 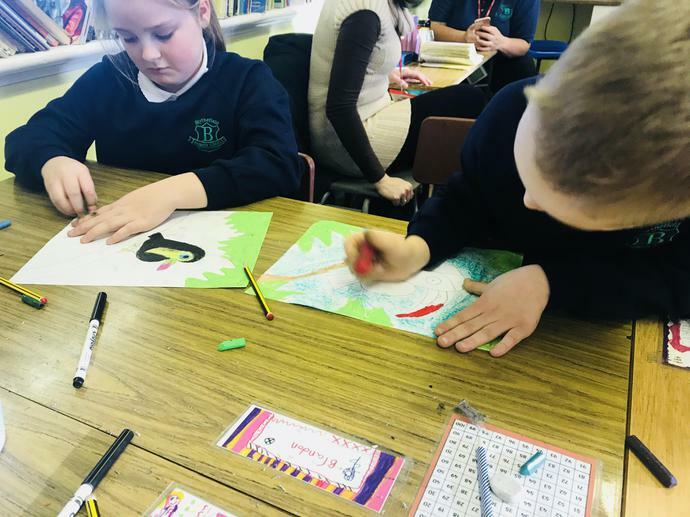 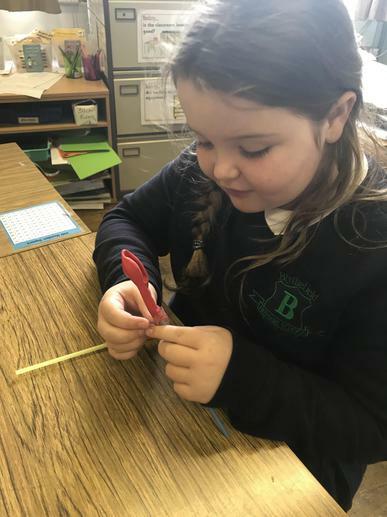 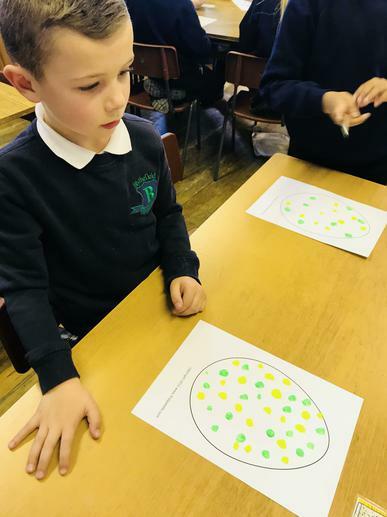 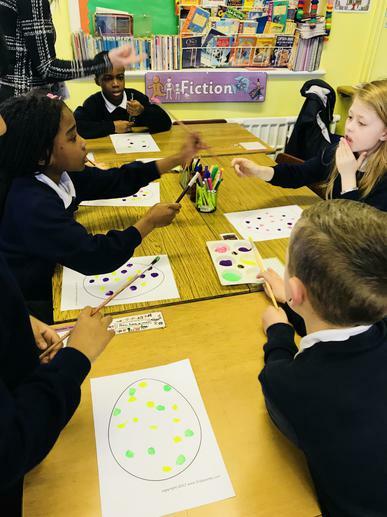 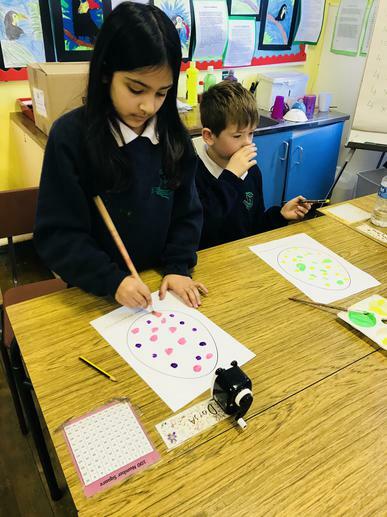 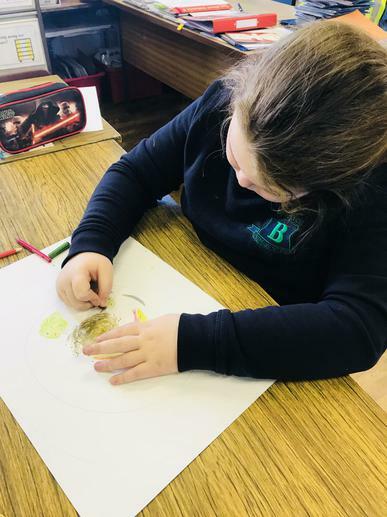 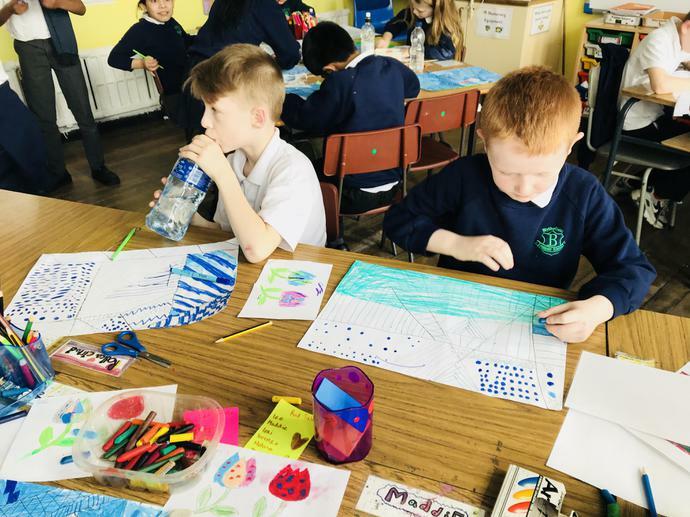 P4/5 enjoyed painting with rulers to decorate their Easter eggs. 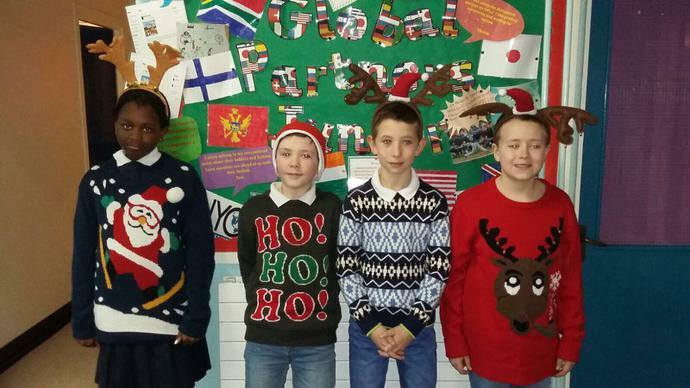 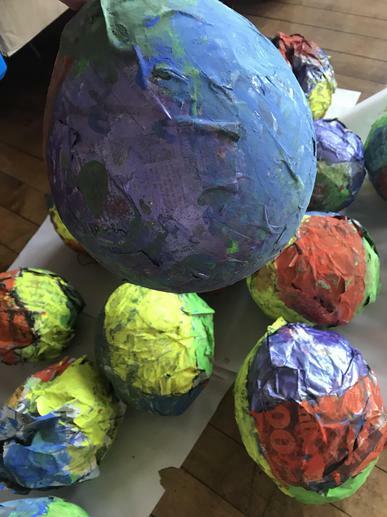 We are looking forward to making these into a garland to hang in the classroom. 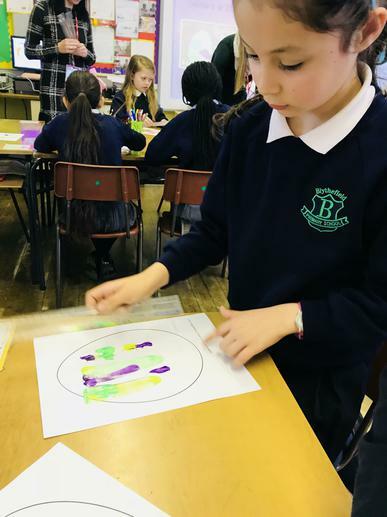 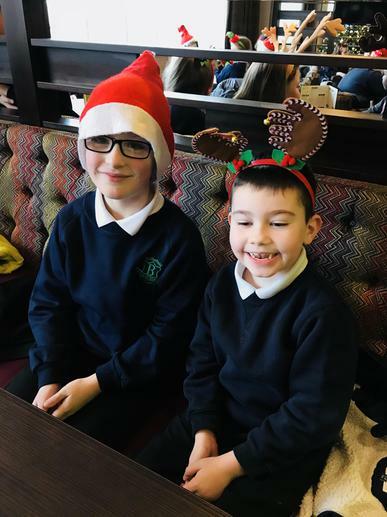 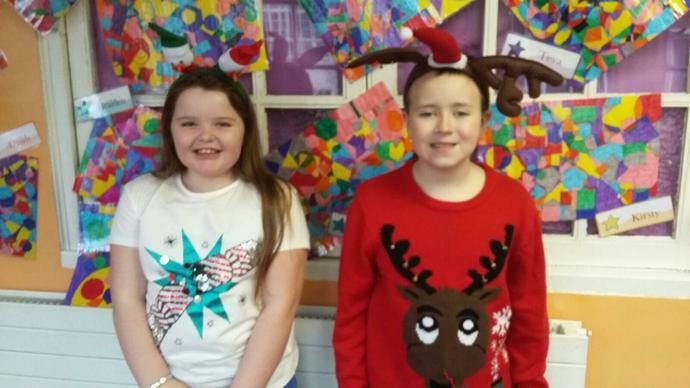 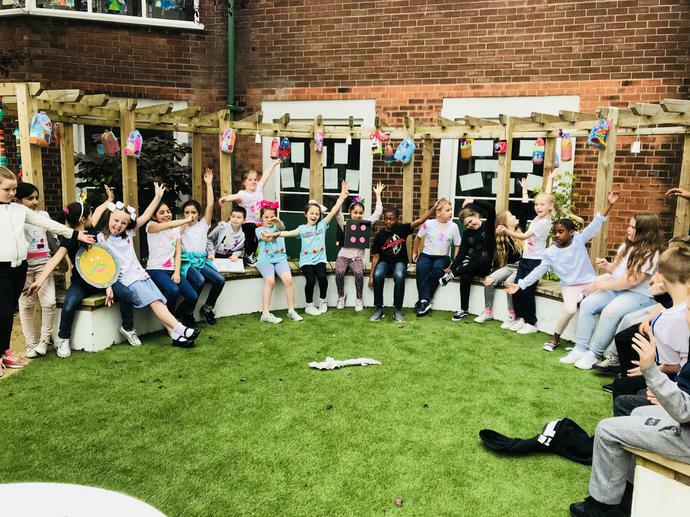 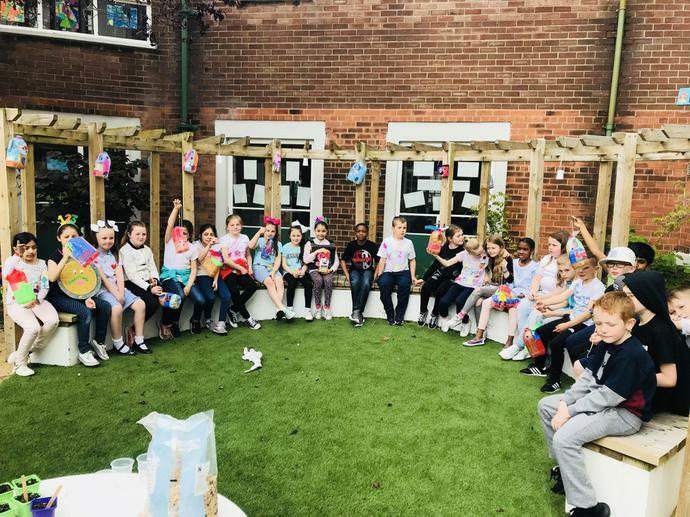 P4/5 had great fun making Dream Catchers with Good Shepherd Primary School. 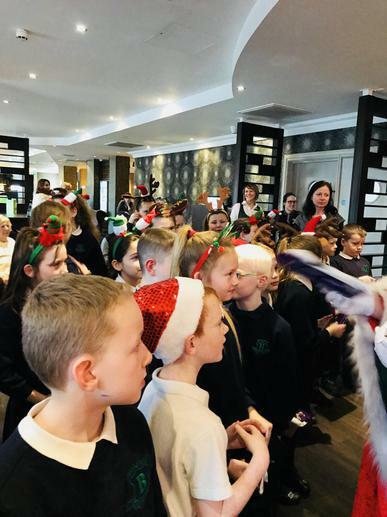 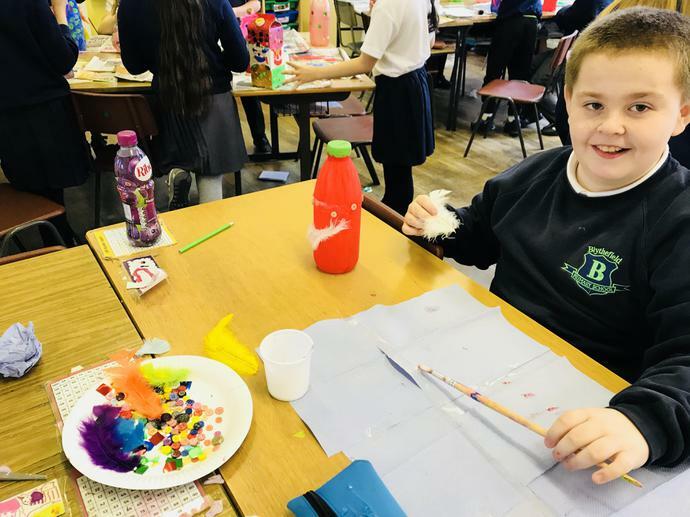 Everyone loved adding glitter and feathers to help chase all our bad dreams away! 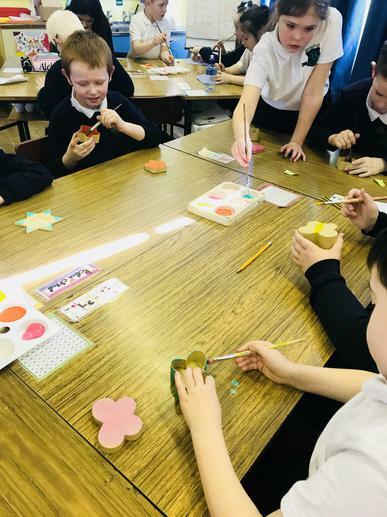 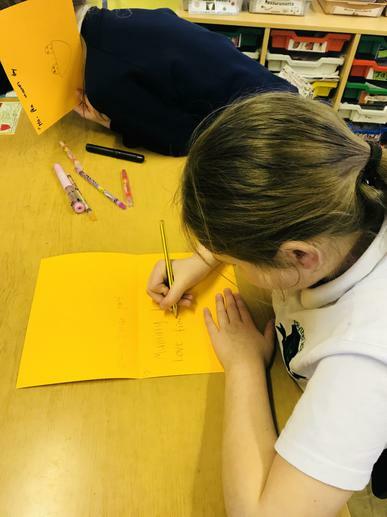 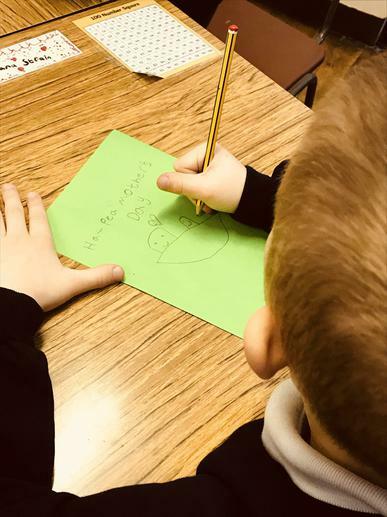 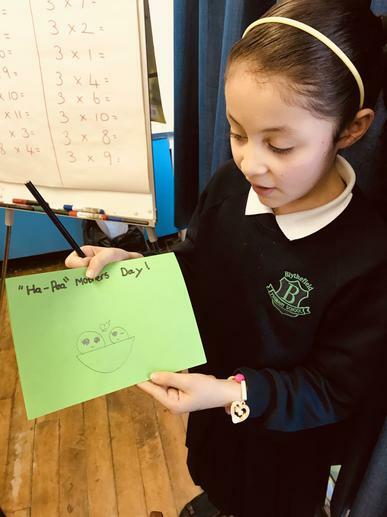 P4 and P5 have been working hard to make gifts for all their lovely mums for Mother’s Day. 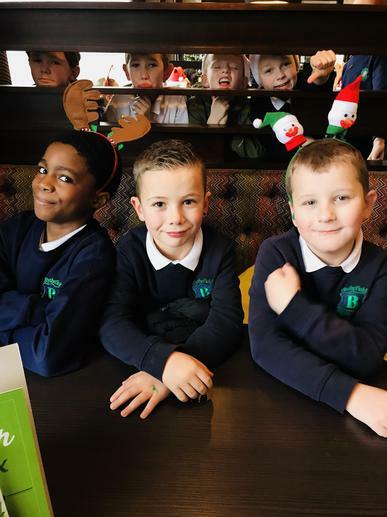 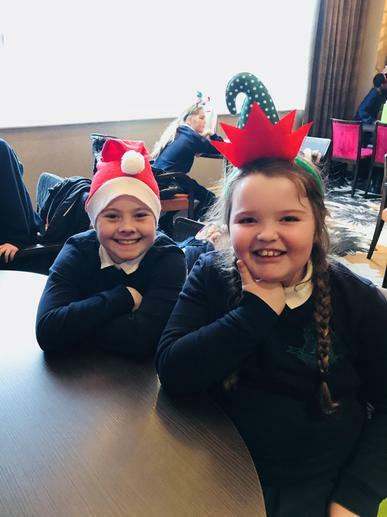 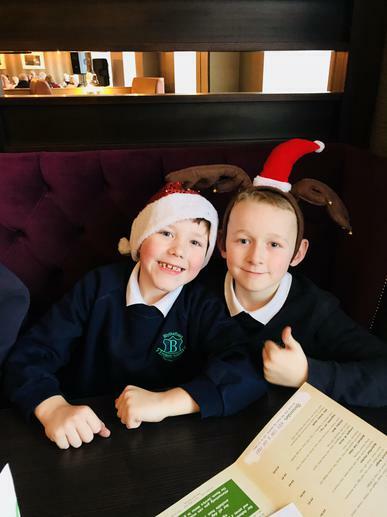 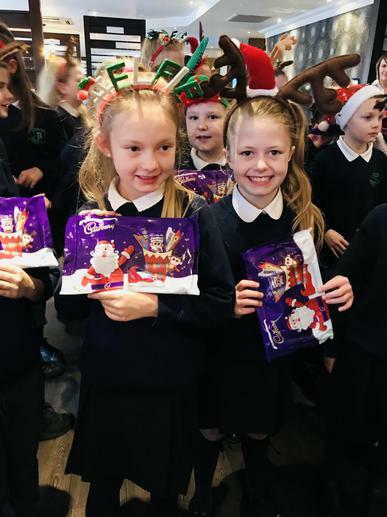 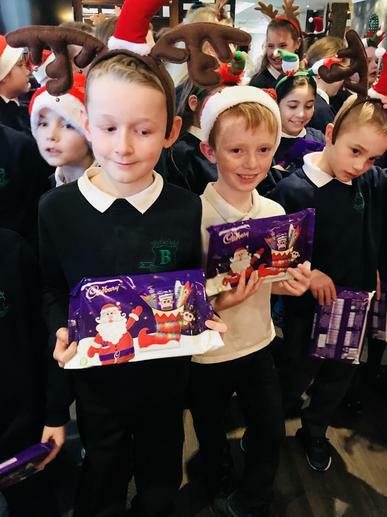 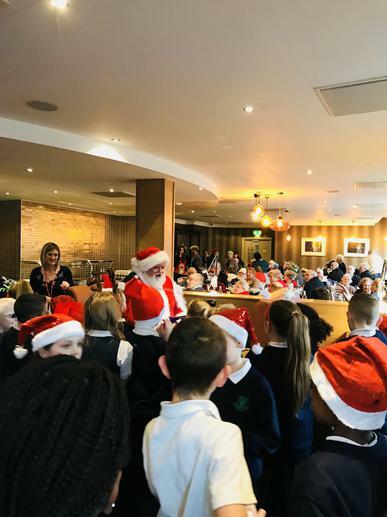 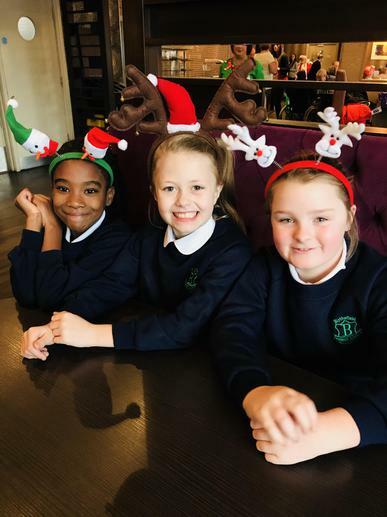 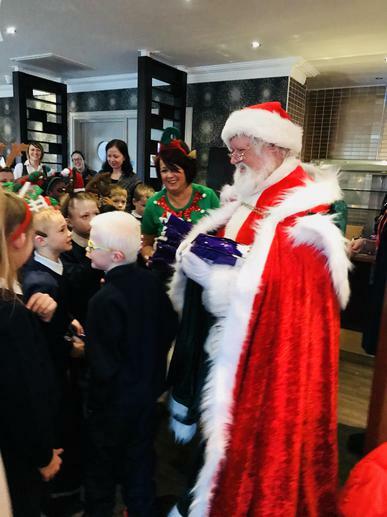 They can’t wait to give their handmade cards and gifts to them. 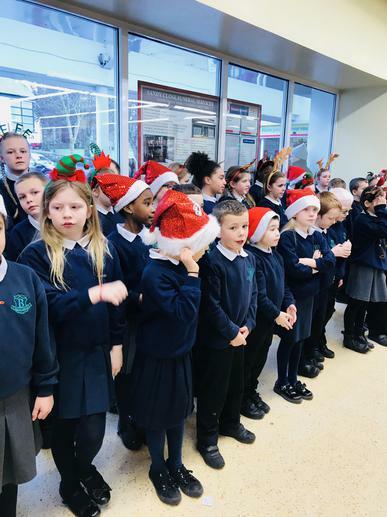 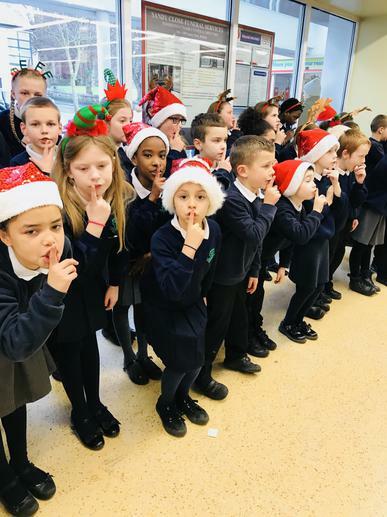 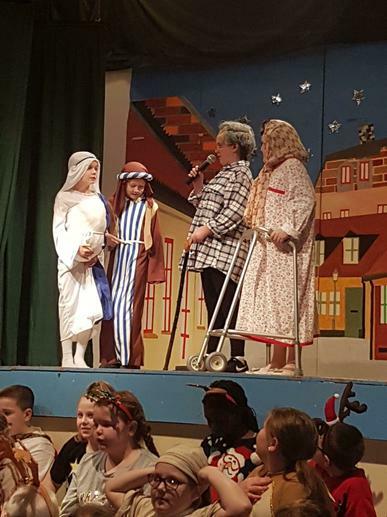 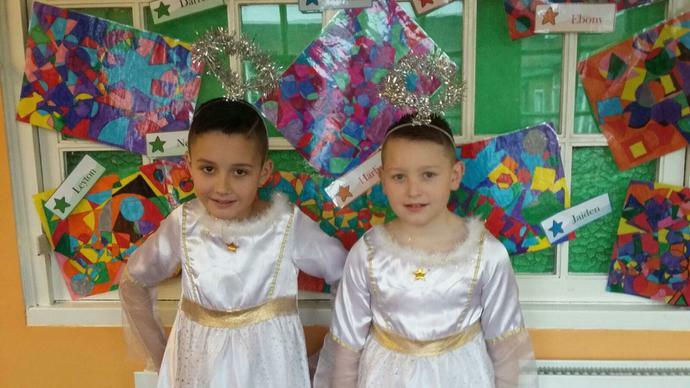 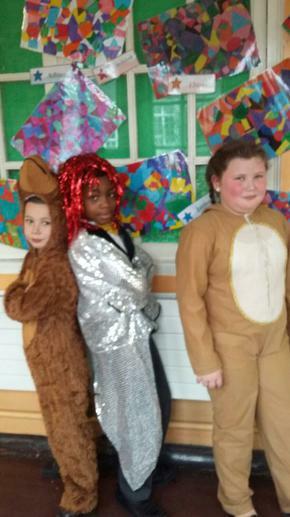 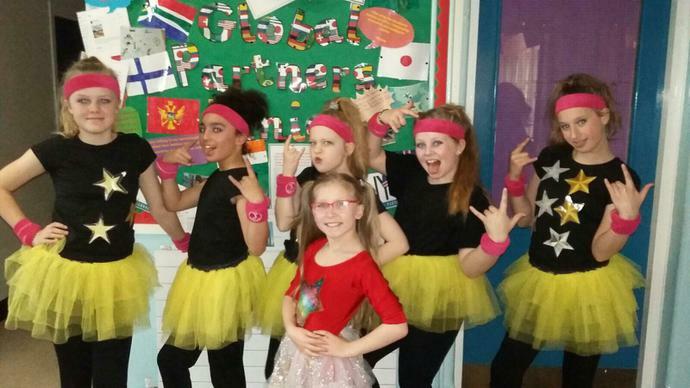 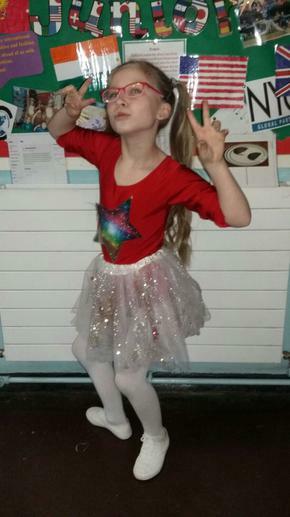 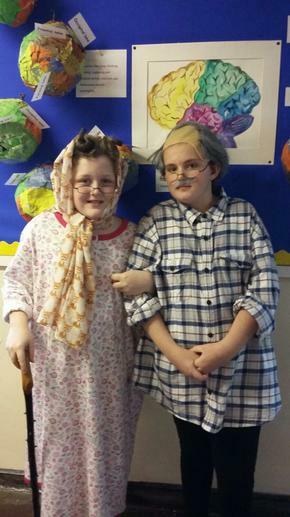 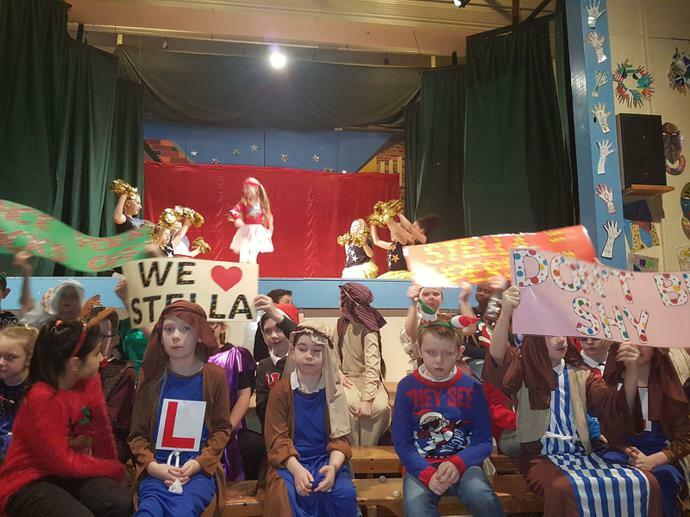 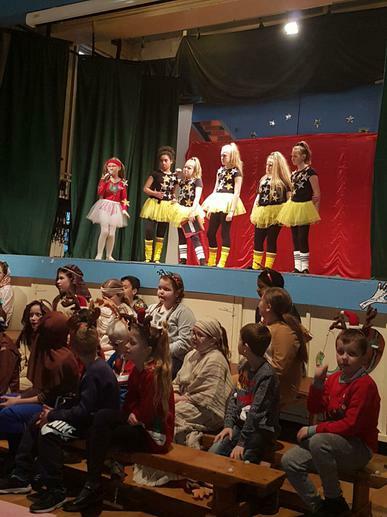 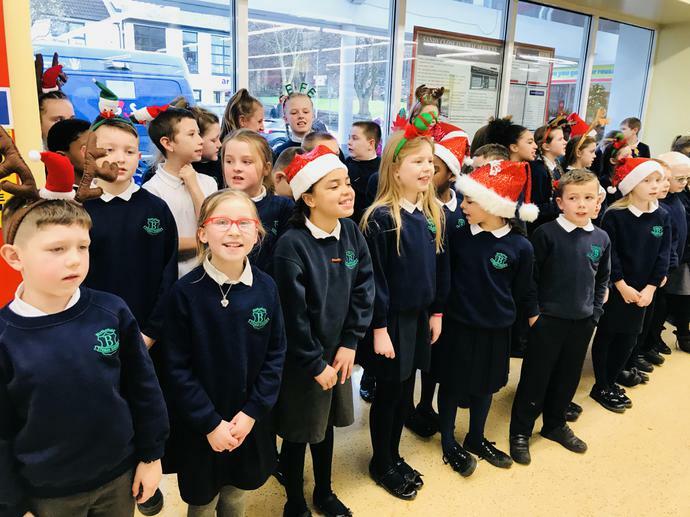 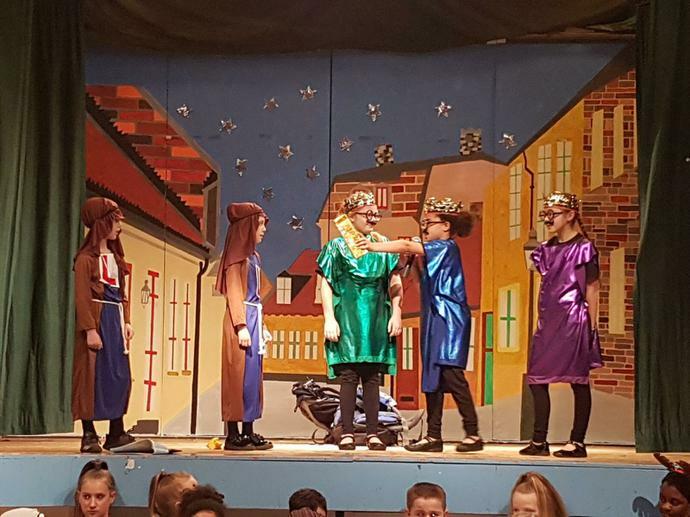 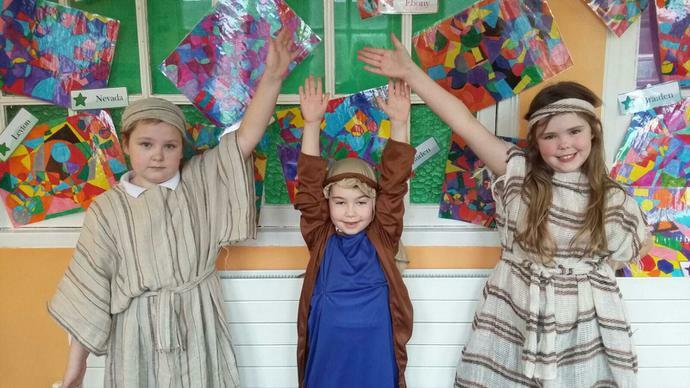 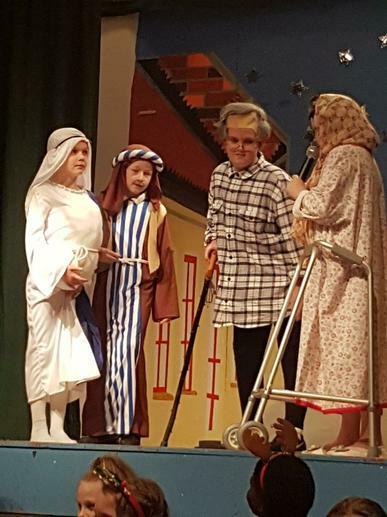 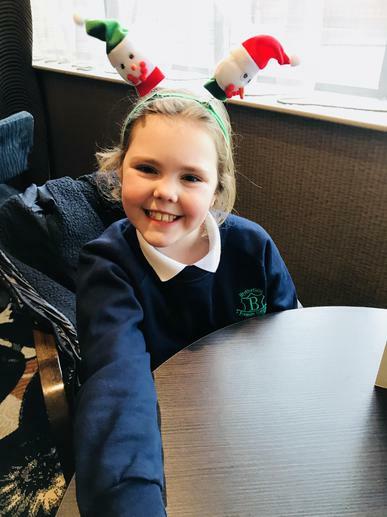 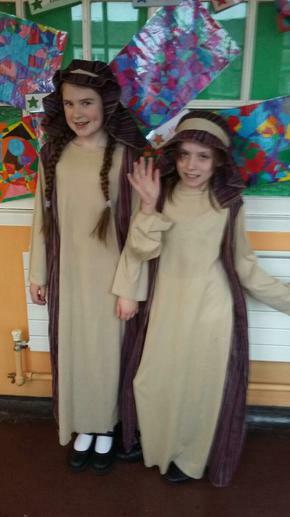 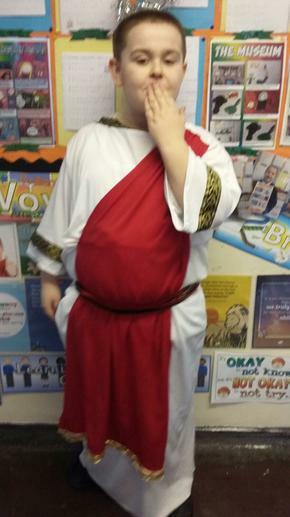 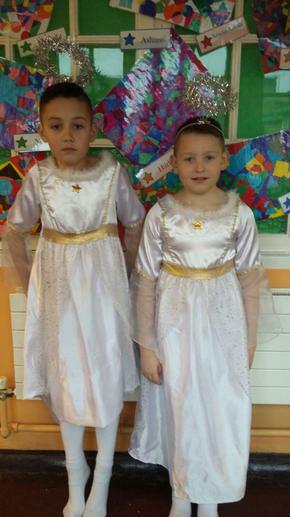 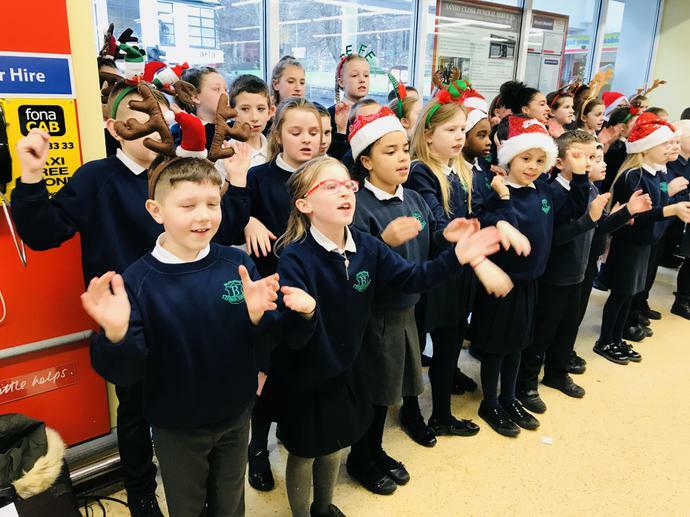 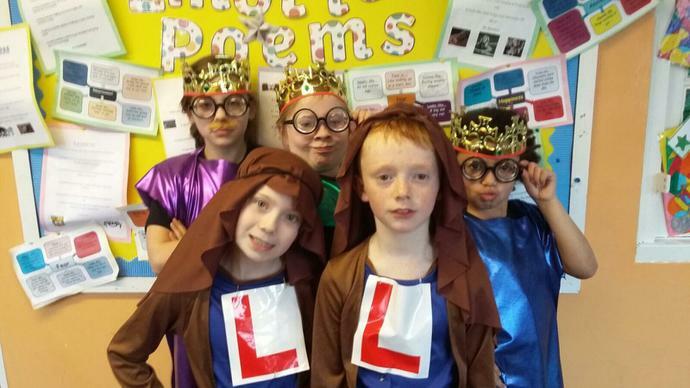 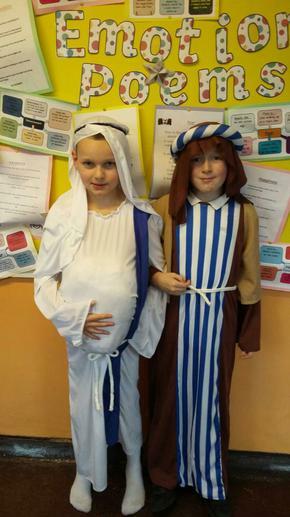 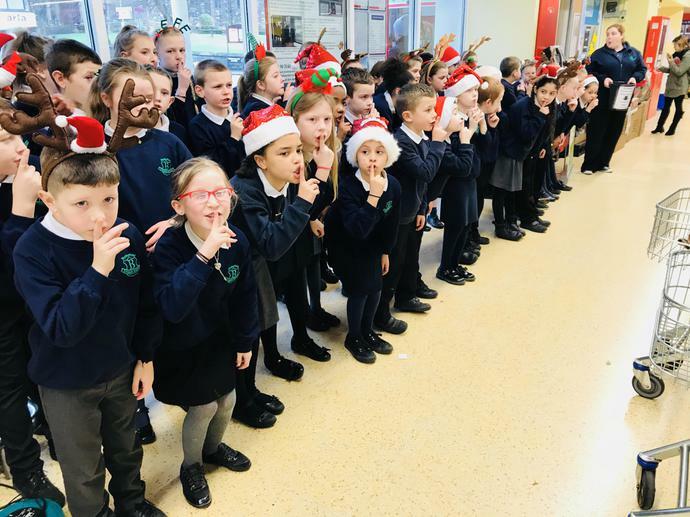 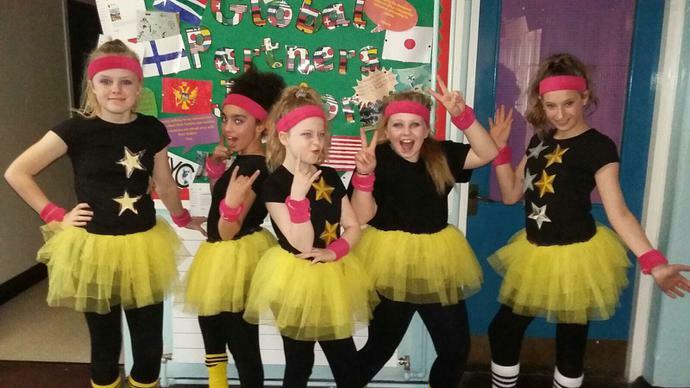 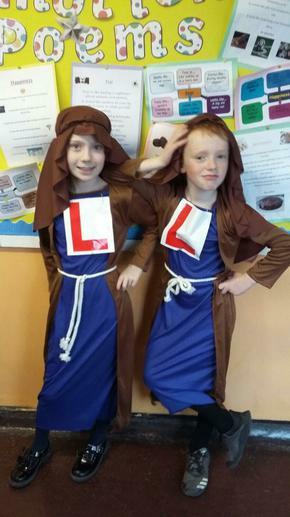 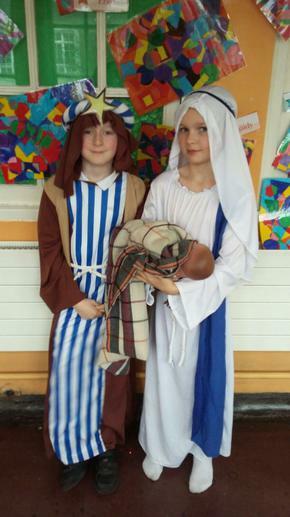 Our production of ‘Super Star’ was FABULOUS! 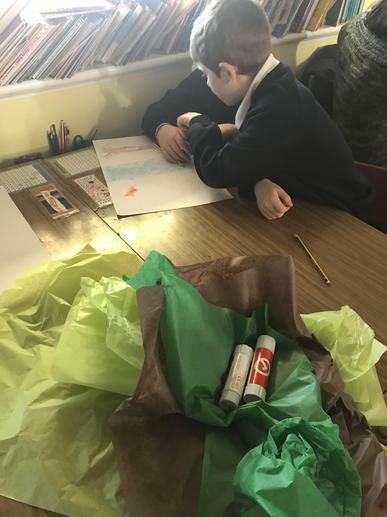 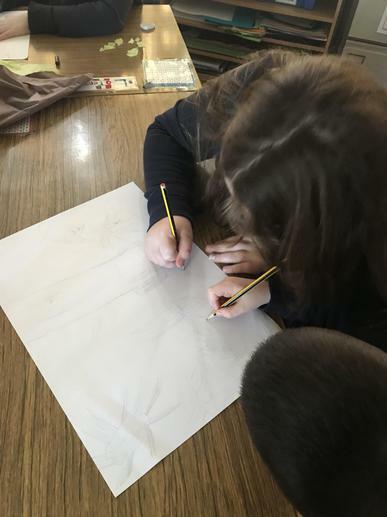 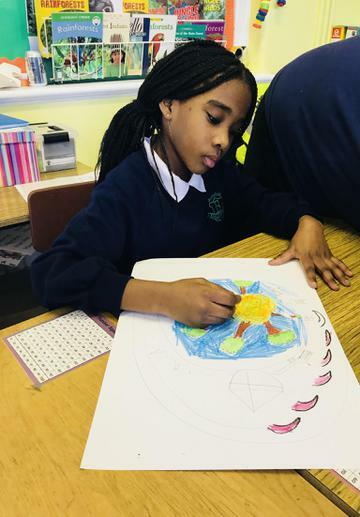 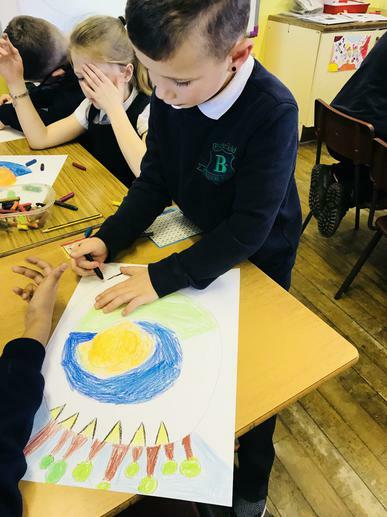 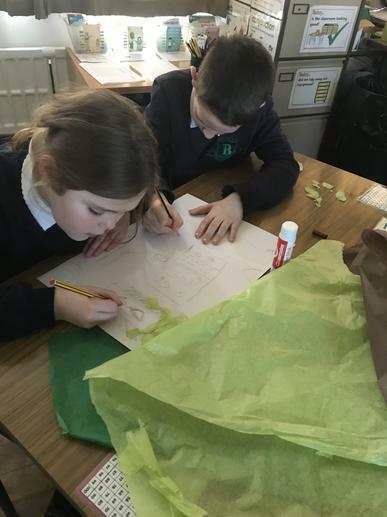 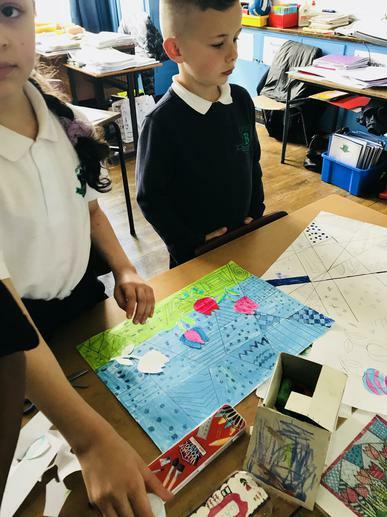 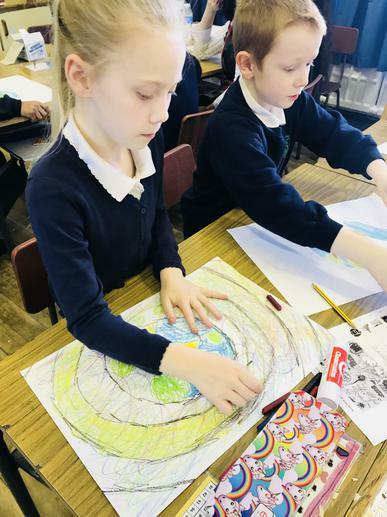 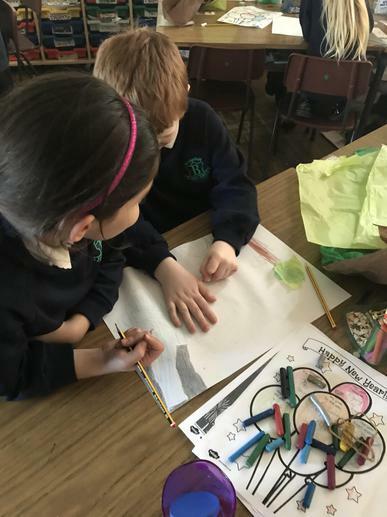 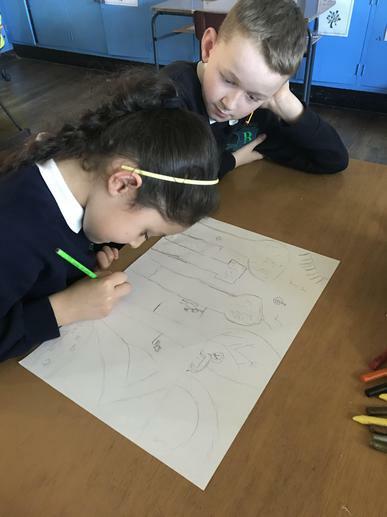 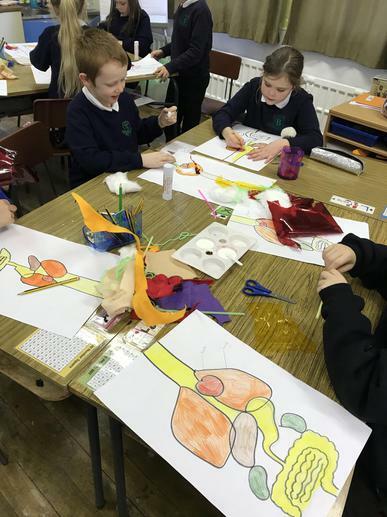 P4 and 5 explored adstract art, they took inspiration from our rainforest topic to complete abstract drawings. 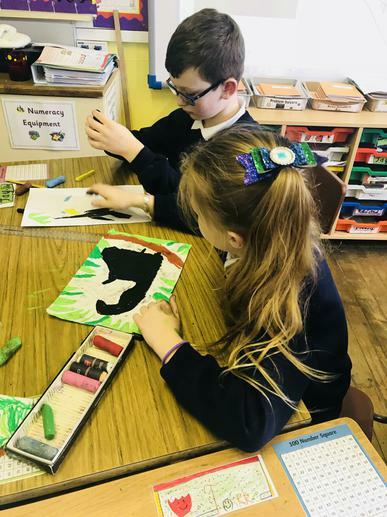 We have been researching animals of the rainforest. 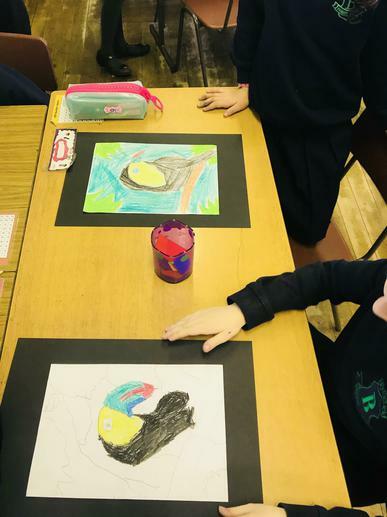 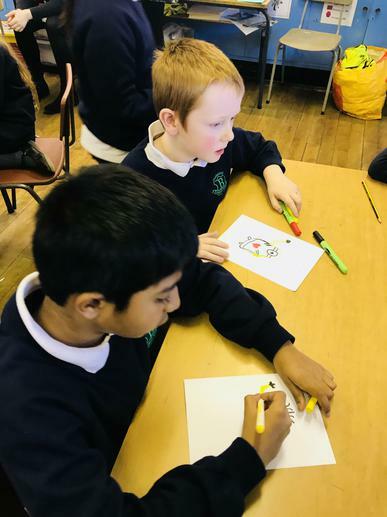 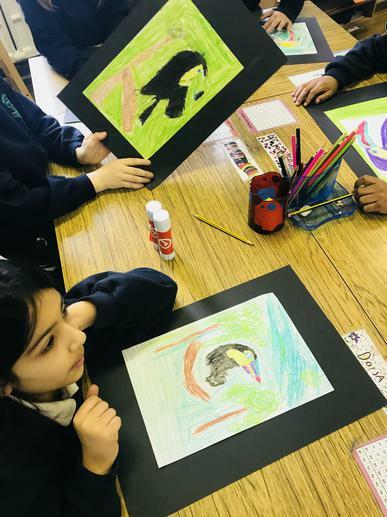 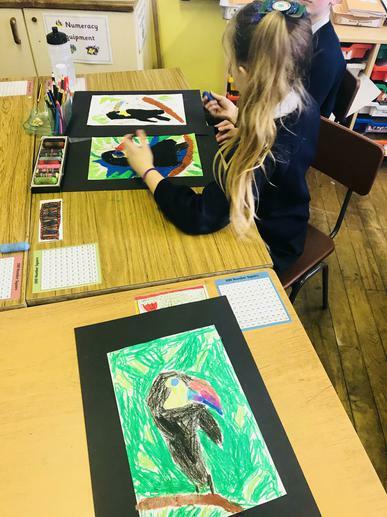 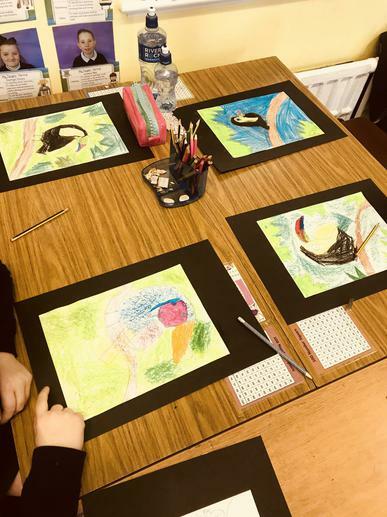 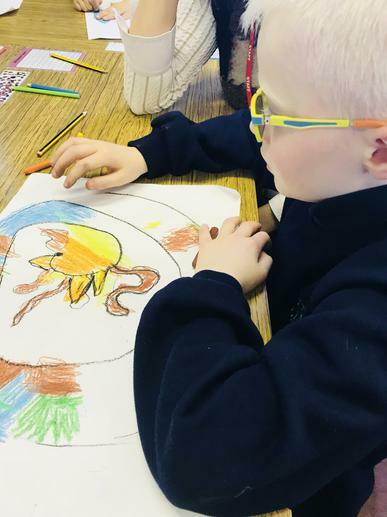 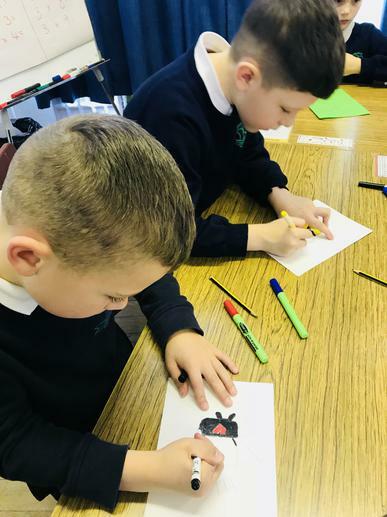 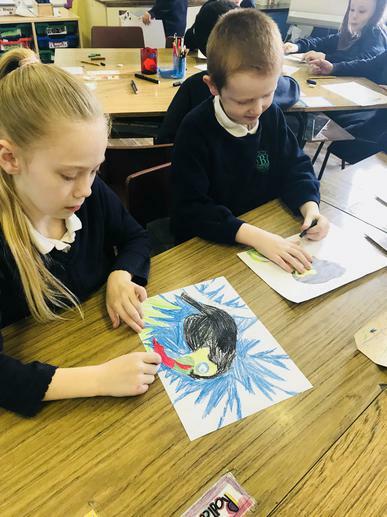 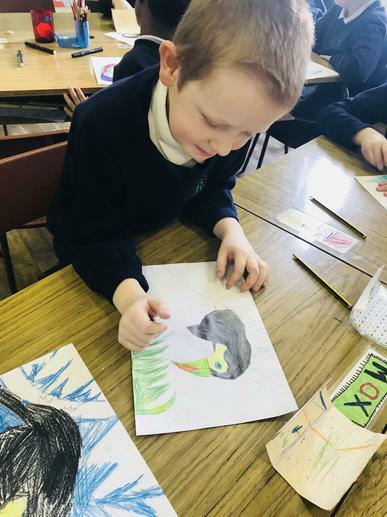 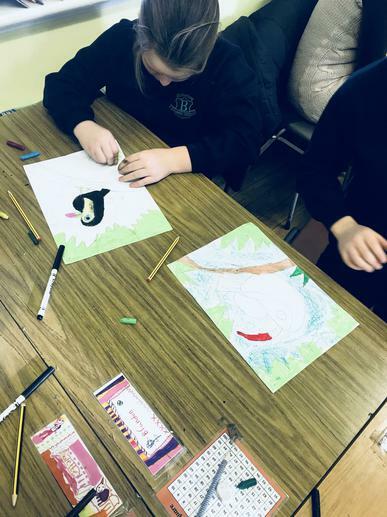 Primary four and five decided to choose the colourful and interesting Toucan bird to draw. 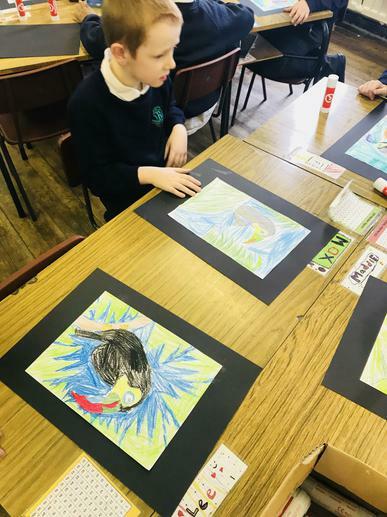 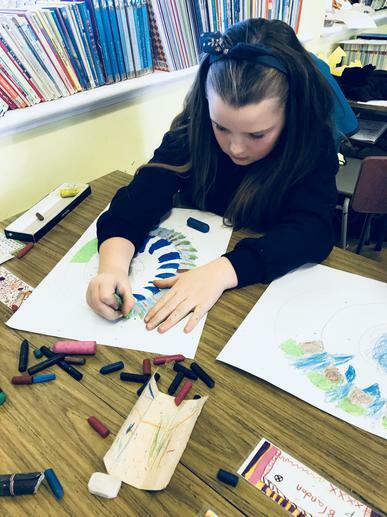 We explored colour and depth to create our own interpretation of this rainforest animal. 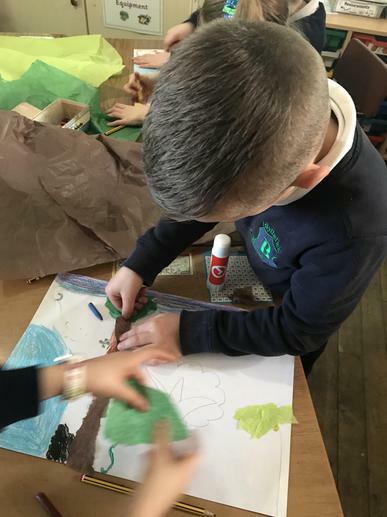 We have started our new topic of ‘Rainforests’ and are creating mixed media drawings of a rainforest. 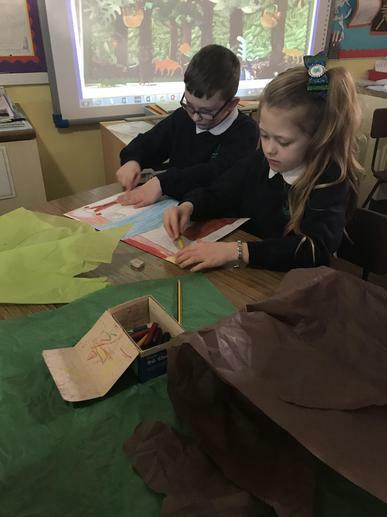 We are including the types of animals and the different layers that we would see in a rainforest. 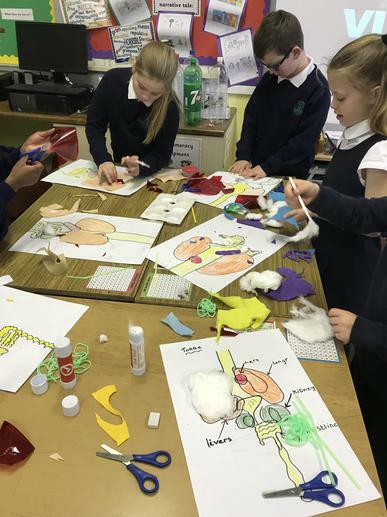 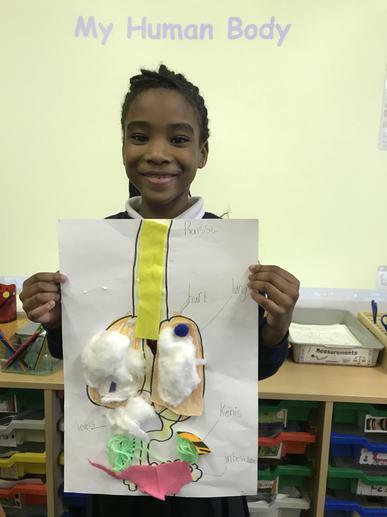 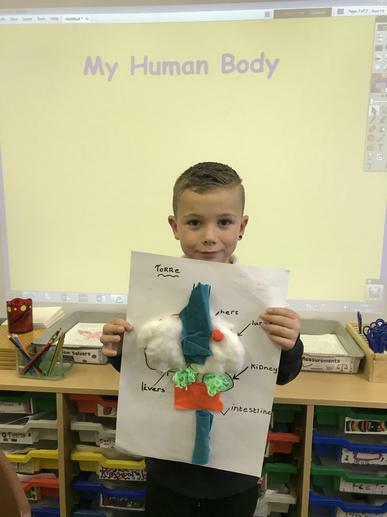 We have been researching how our body works and learning about our organs. 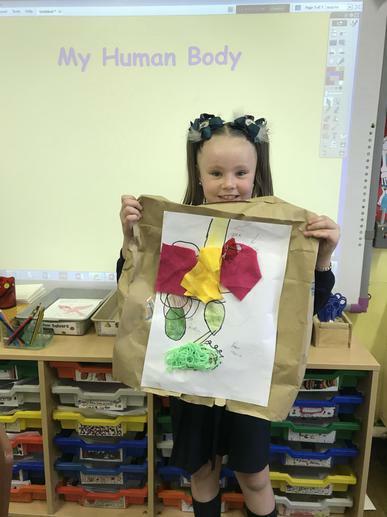 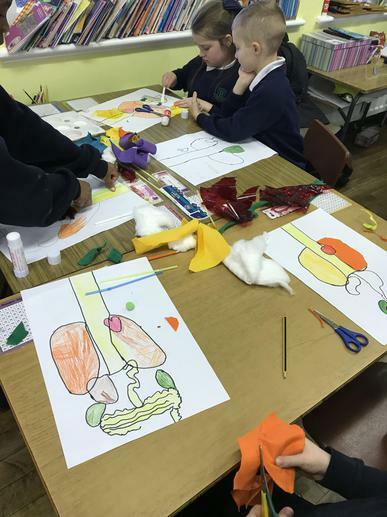 So for Art this week we made our own Organ Body Bags using a range of materials. 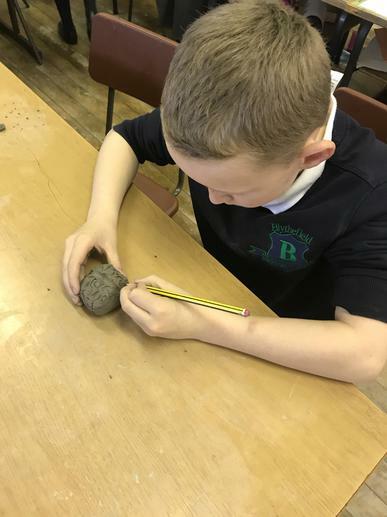 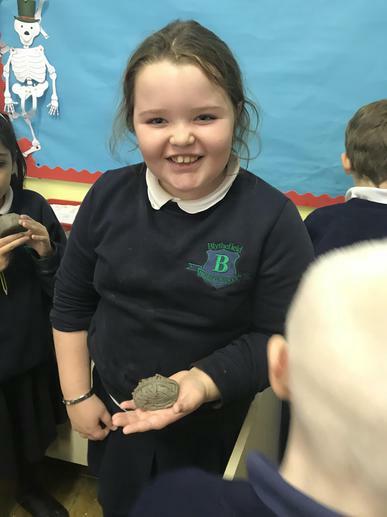 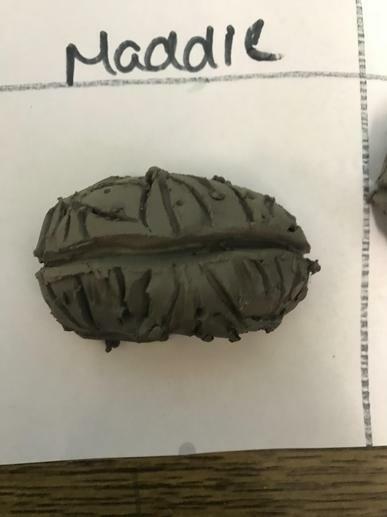 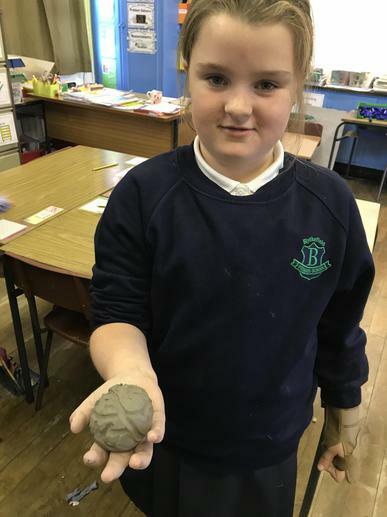 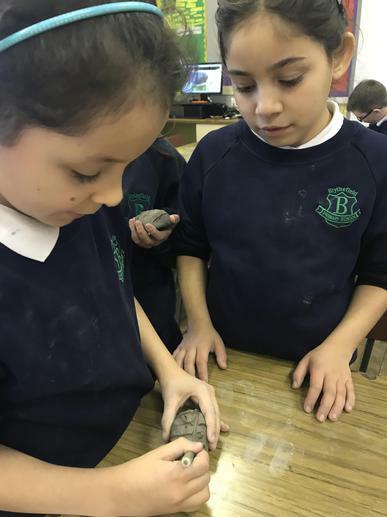 We made our very own clay brains in P4/5. 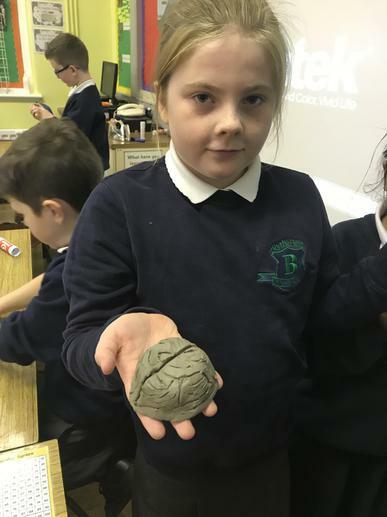 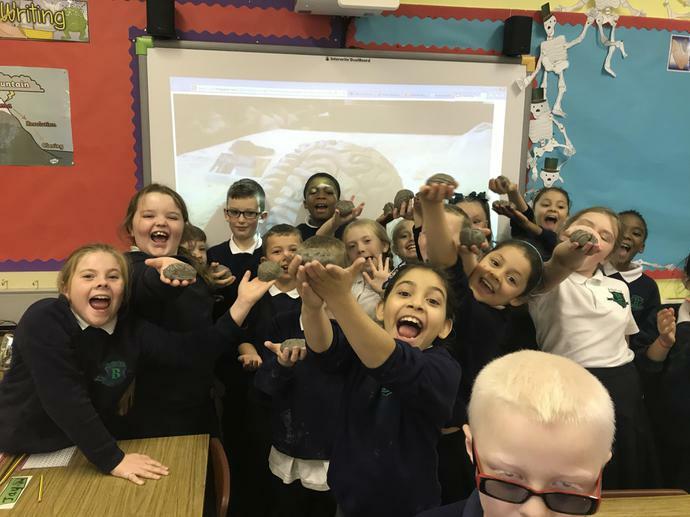 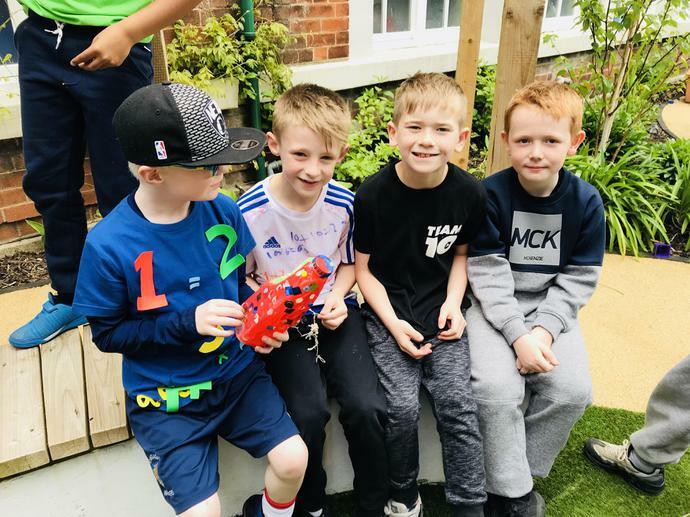 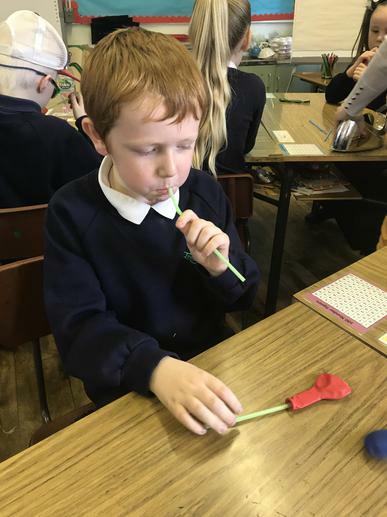 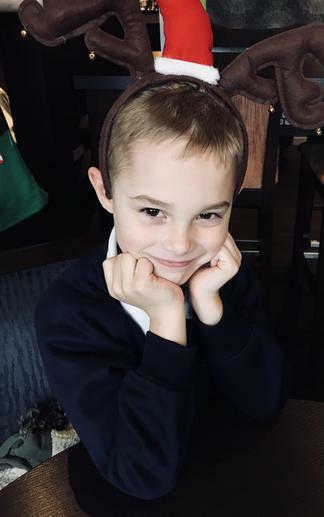 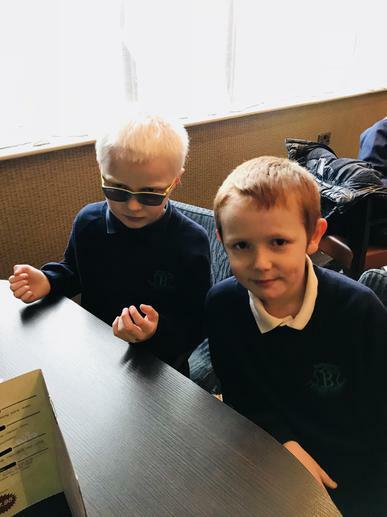 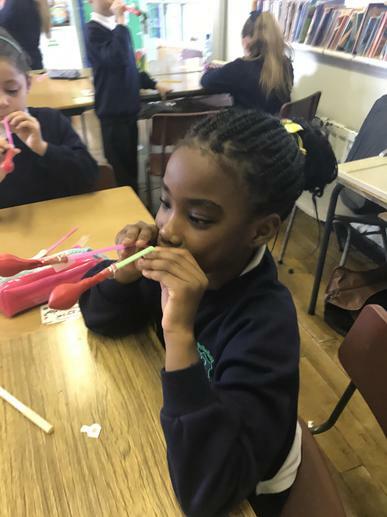 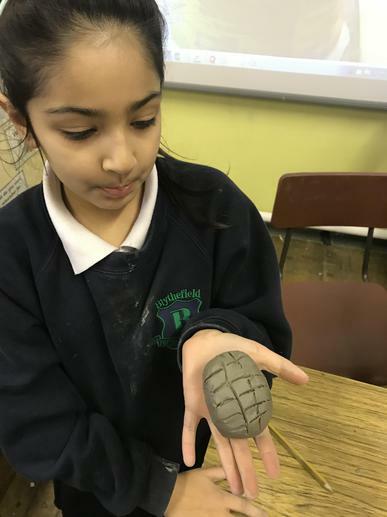 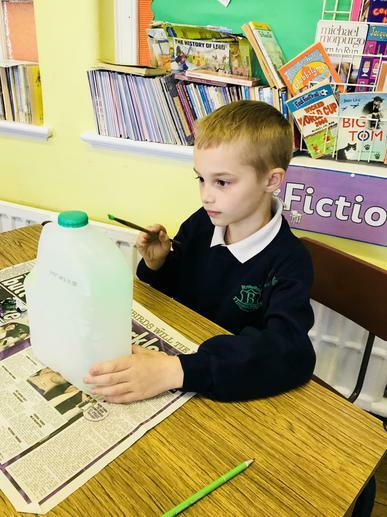 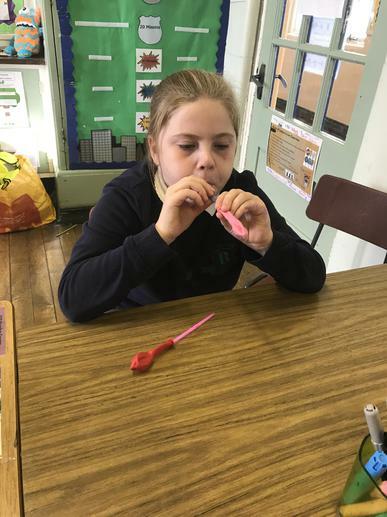 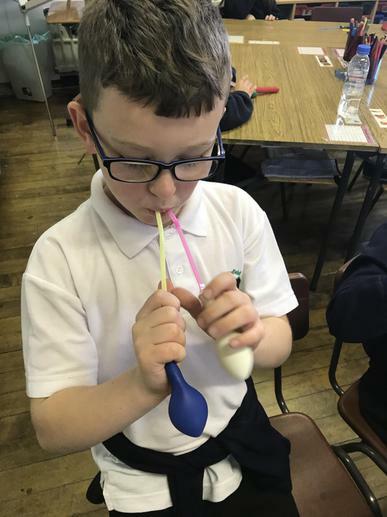 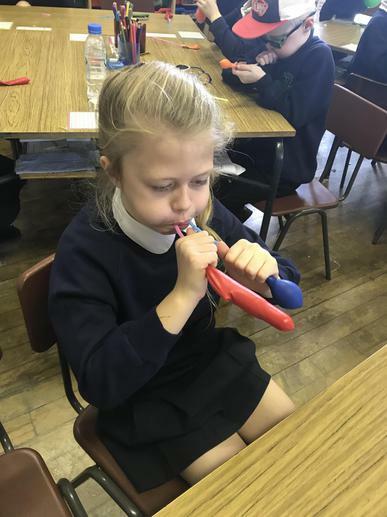 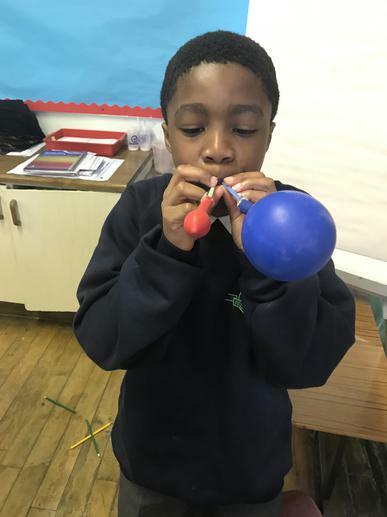 We explored how to mould our brains using a range of techniques and equipment. 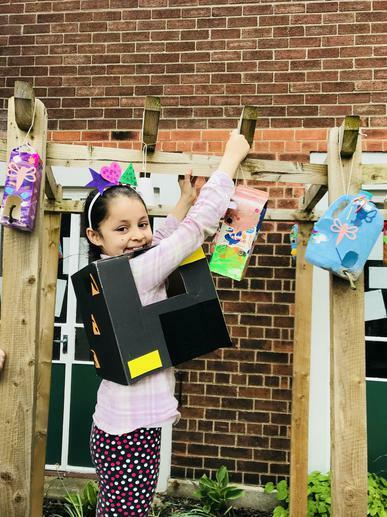 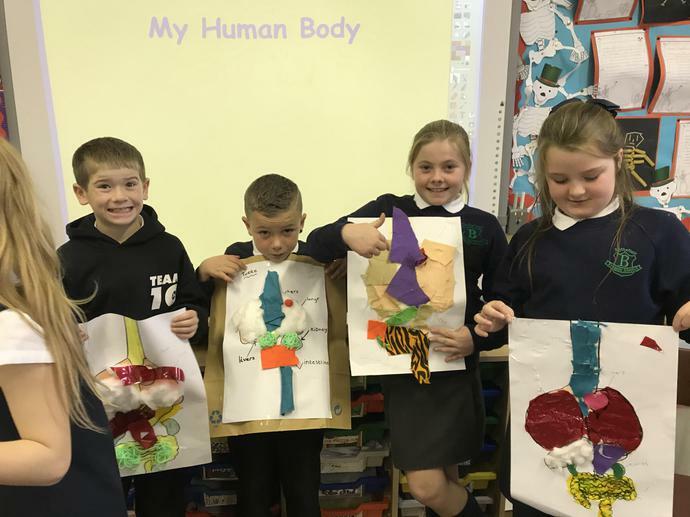 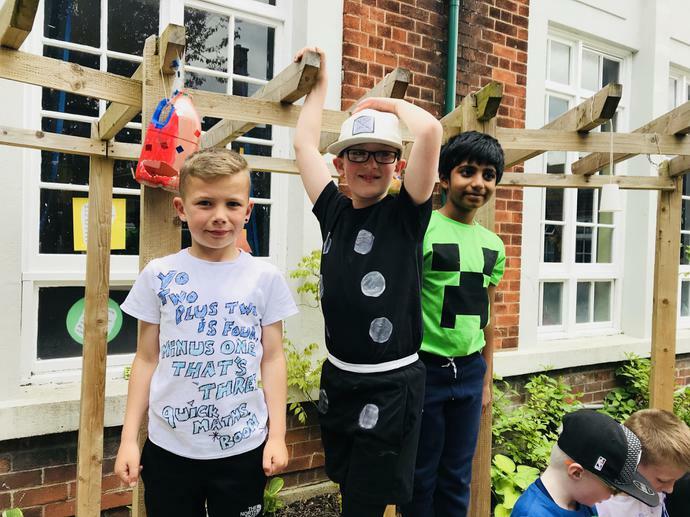 Over the last few weeks we have been working on our Human Body Boxes. 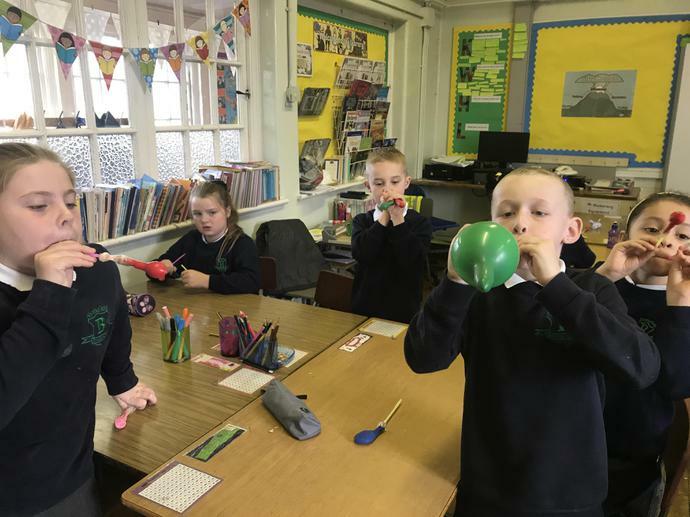 Today we made a representation of our lungs using balloons and straws. 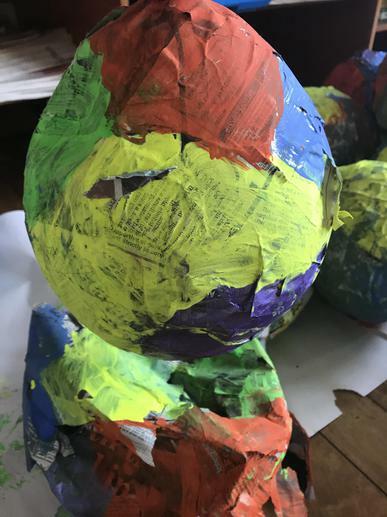 We look forward to finishing these soon. 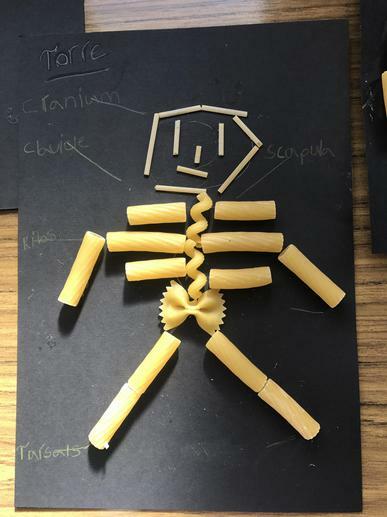 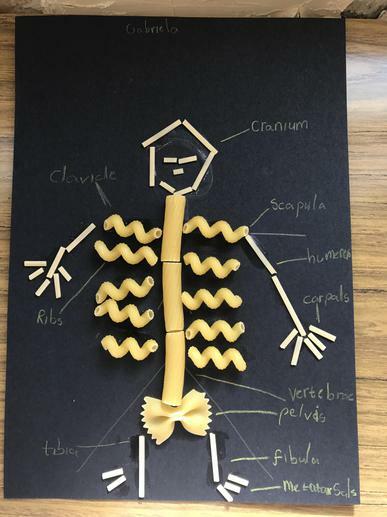 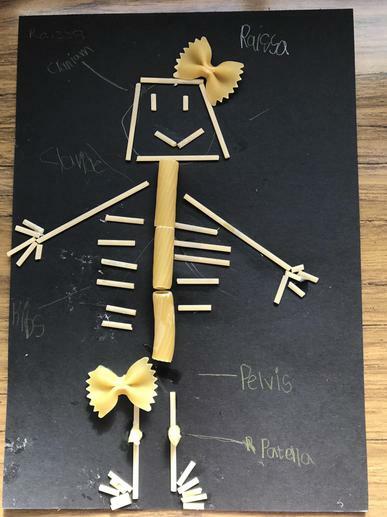 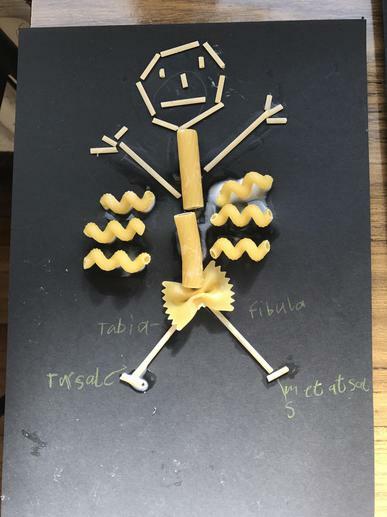 As we are learning about the Human Body we thought we would make and label our very own skeletons using pasta. 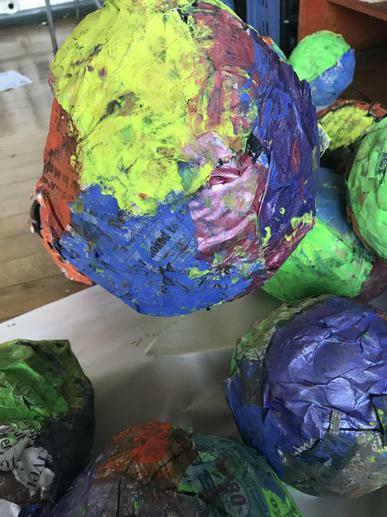 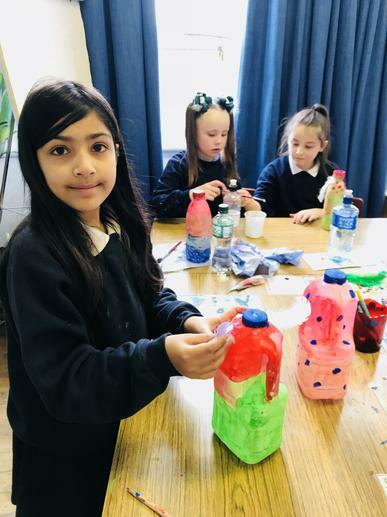 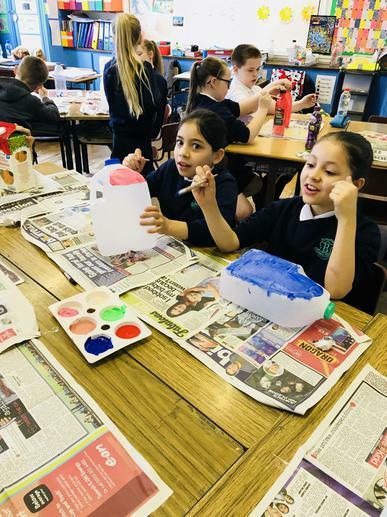 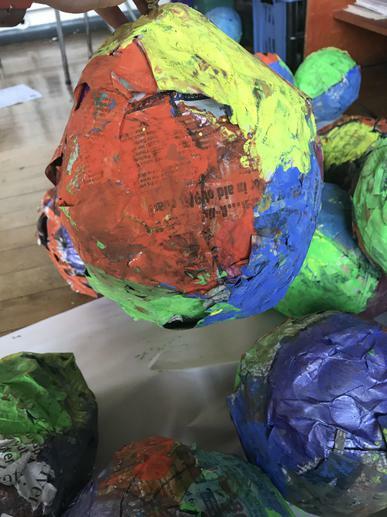 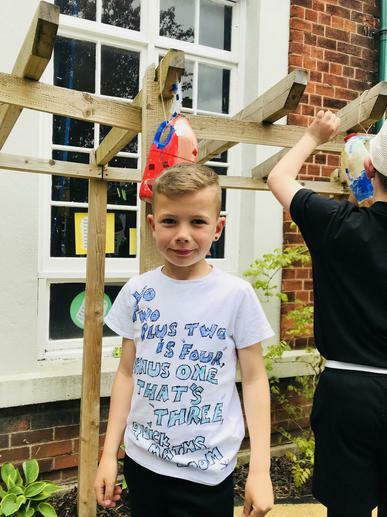 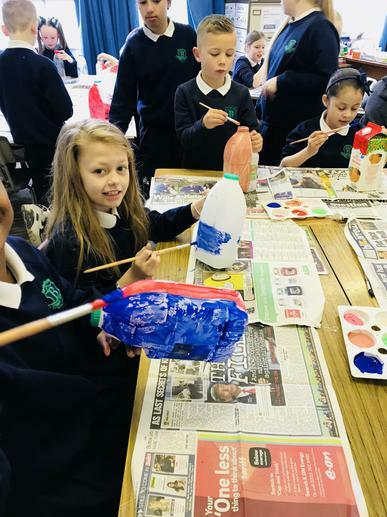 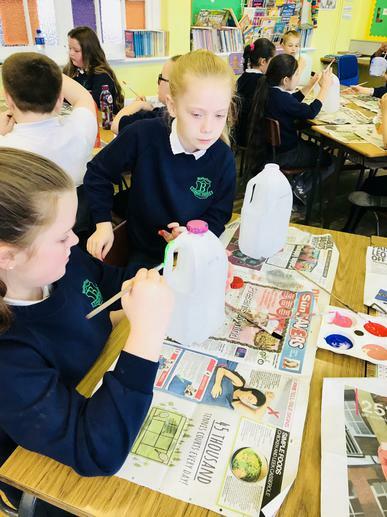 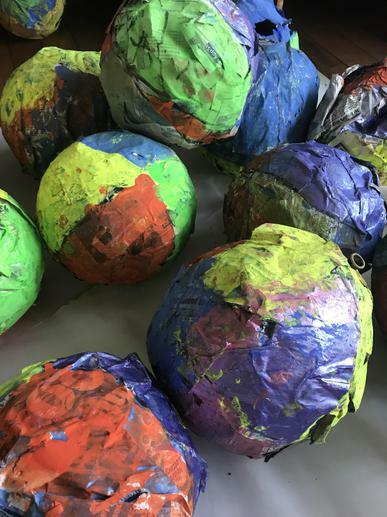 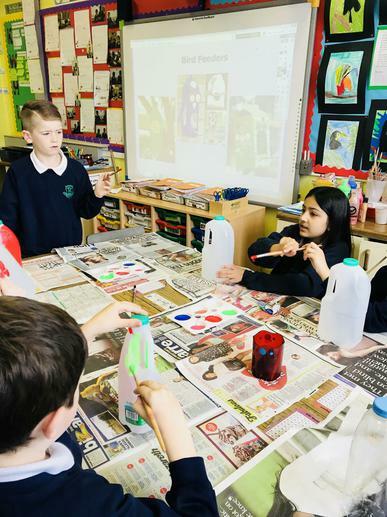 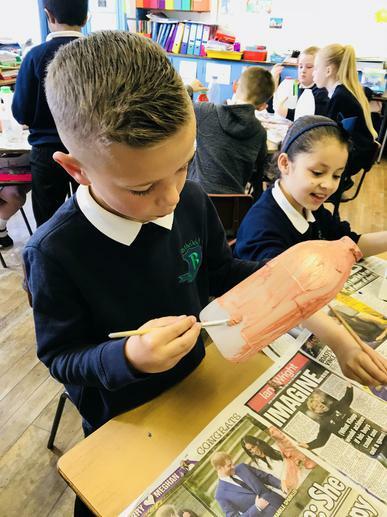 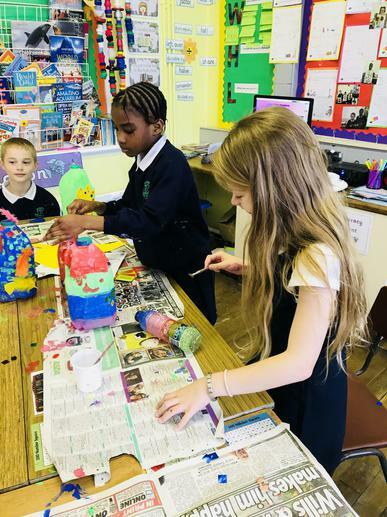 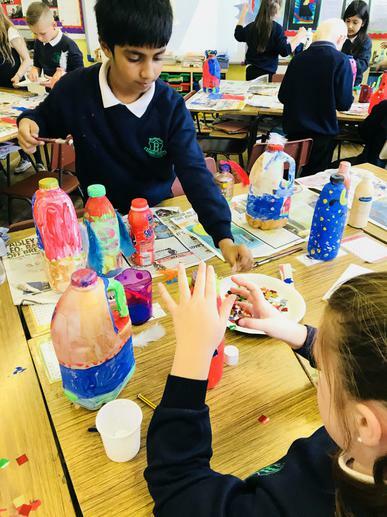 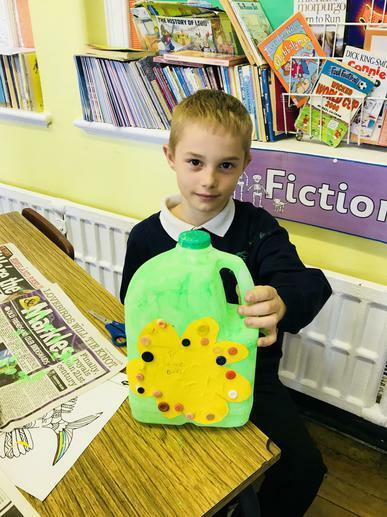 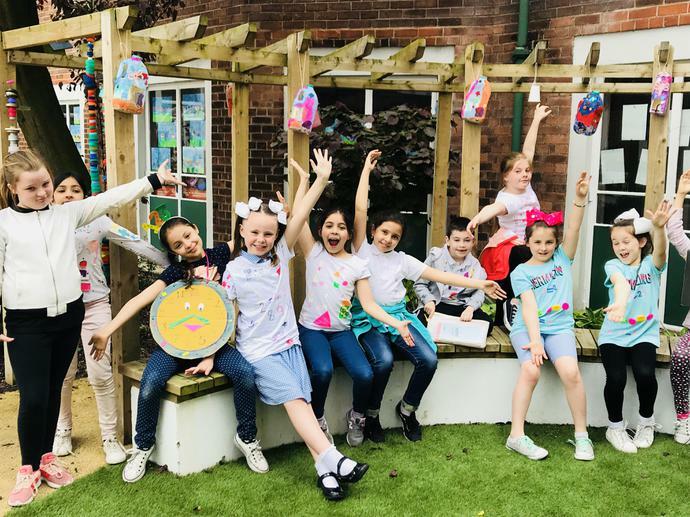 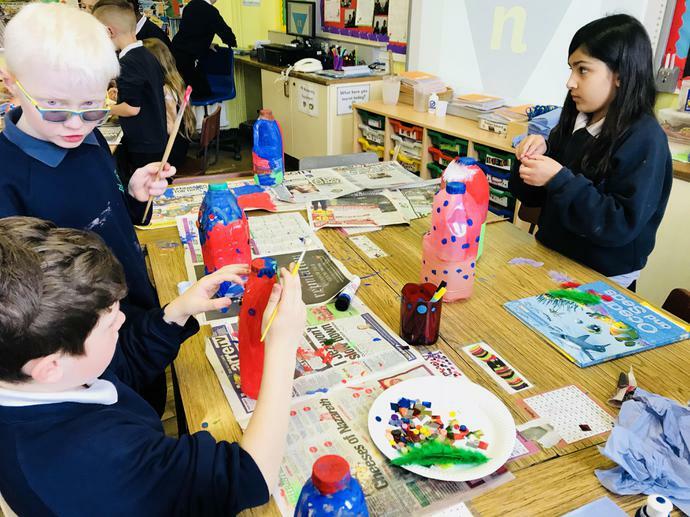 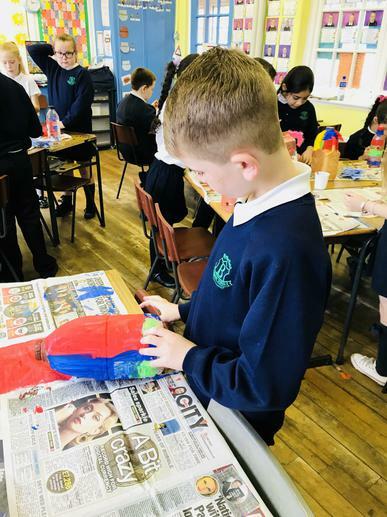 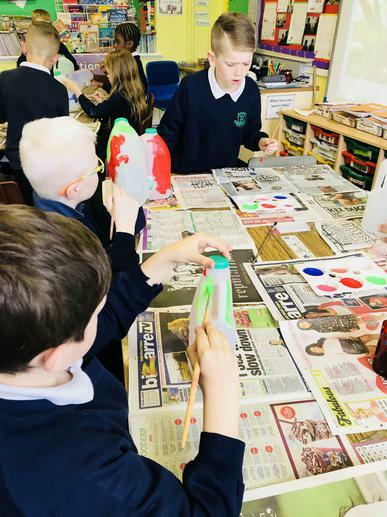 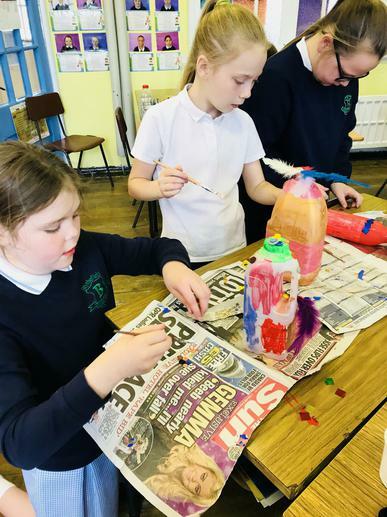 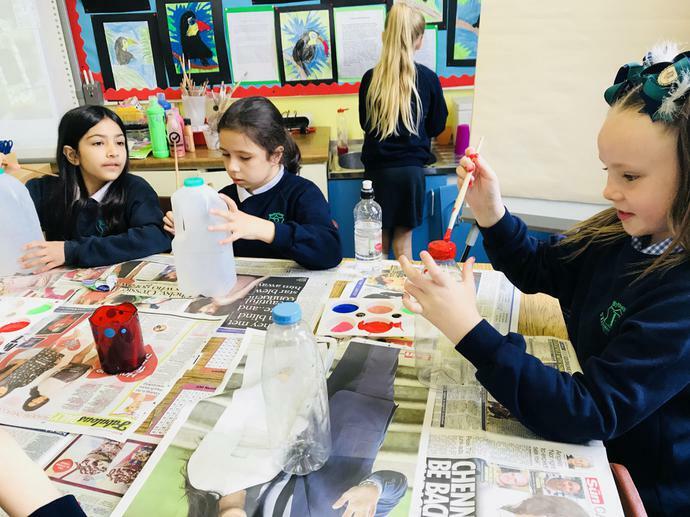 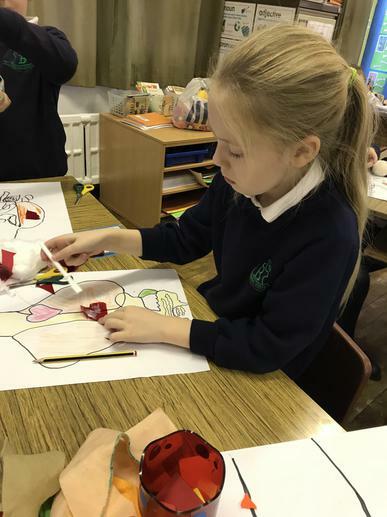 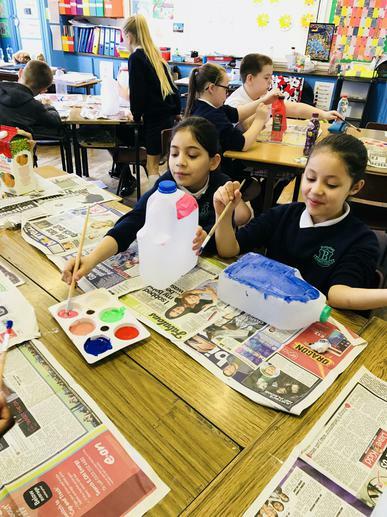 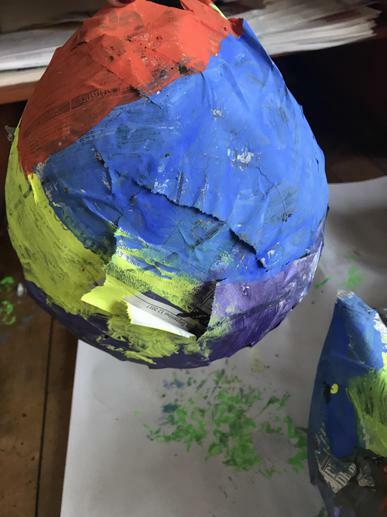 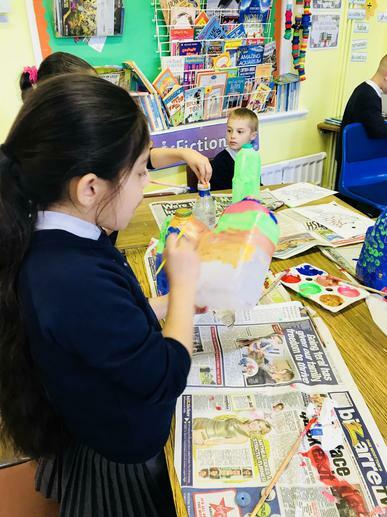 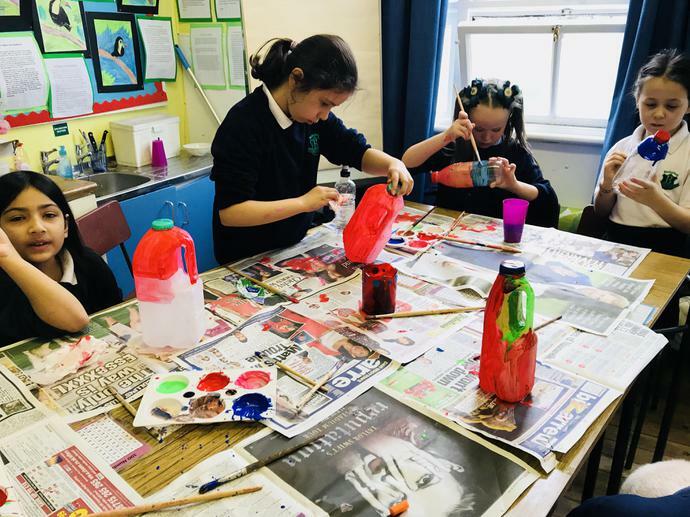 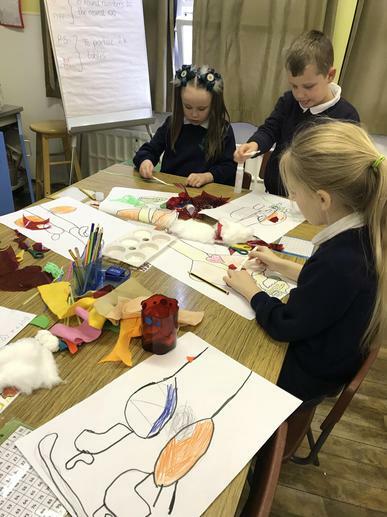 P4 and 5 enjoyed making paper mache brain models in Art class. 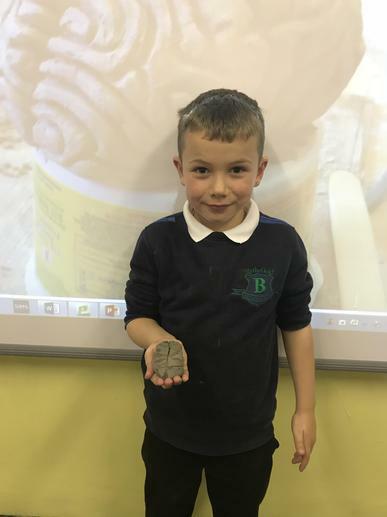 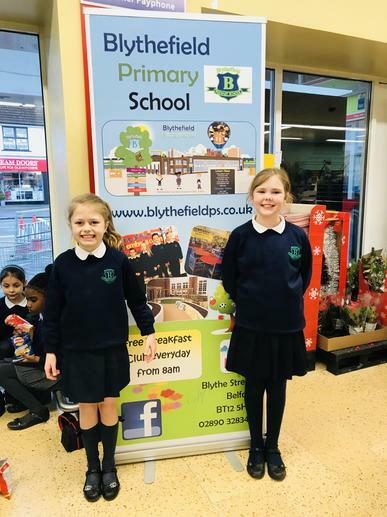 We can't wait to put these on display in the classroom.